Today’s post is dedicated to any parent who has had to learn the difficulty that surrounds waiting for an answer on your child’s health. I don’t care if it’s the minutes waiting in the office for a quick strep test or the agonizing time parents go through waiting for more major results, there is no stress like that of the mental torture a parent endures when given the time to imagine their baby in any amount of discomfort. Summer has come and gone, for us it was packed full of adventures and memory-worthy family time. We were able to spend a lot of time regrouping and for the first time in a year, we had a brief reprieve from the constant and strenuous schedule that is our real life. Now school has begun, both for me and Kayla. 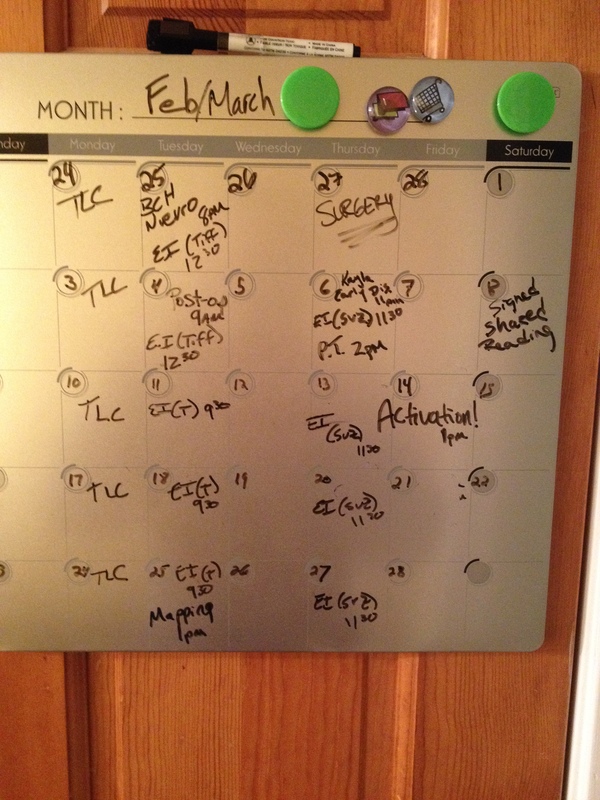 Finn’s appointments and therapies are getting scheduled for regular weekly time periods again. Dan gets the burden of being the daytime parent/Finn’s advocate thrust back mainly on his shoulders while I’m at work. It’s an adjustment we knew was coming, but that won’t make it any less difficult. Even though we had a lot of down time this summer, we also got something accomplished that we have wanted for a while now. I’ve written previously about our worries about Finn’s development outside of just his hearing and language. 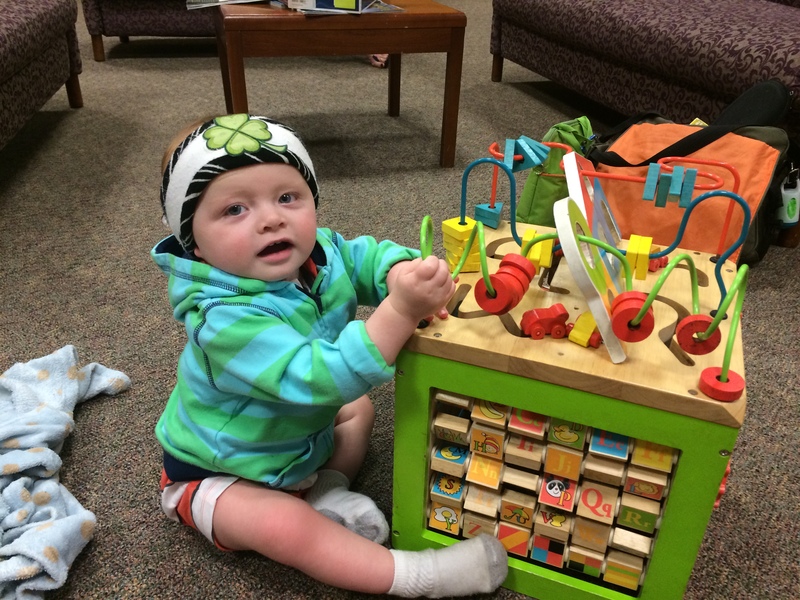 He’ll be 16 months in just a couple of days and though we are so proud of the progress he has made in the last few weeks, it has been obvious to us that there are some major gaps in his development unrelated to hearing. We’ve known this for awhile and actually started raising concerns to Early Intervention (EI) as early as last January when they assessed him. We advocated all spring and Finn was in to see a neurologist (who cleared him), started OT at Boston Children’s Hospital (BCH), added PT to his EI speech & language services. All these things were great and we definitely saw some progress (especially after he started OT), but by June when he was evaluated by EI for his yearly assessment, we were still concerned that Finn seemed to be significantly delayed in a lot of areas. As good as most of EI’s services have been, they’ll be the first to admit that they are limited in what they can do as far as diagnosis and more specialized areas. At that point we had some of his specialists saying he was fine, just a little delayed, some blaming his low muscle tone, some saying it could be vestibular, and other “maybes” and “could bes”. Our heads were spinning: are we just overreacting or are we not being proactive enough?! Are we getting the right services for Finn or are we expending unnecessary energy (for him and us) on services that aren’t even effective? Or does he need MORE services and we aren’t doing enough? At this point our development specialist through EI suggested that we might want to take him to BCH for an overall assessment. Our trust in BCH has never waivered and we put our faith in the doctors there. The assessment day was long, but the doctor was (as usual for BCH) incredibly patient and thorough. She even took part of her time to talk with Kayla about how she felt about the past year and Kayla got time to express herself and how she sometimes doesn’t feel as special as Finn even though she loves him very much. It was a very touching connection that the doctor made with her that she had absolutely no responsibility to do, but did anyway because, as time has proven again & again, BCH treats the family, not just the patient. After the assessment, the doctor went above and beyond to make me feel like Finn was her most important priority. Unlike a lot of Finn’s caretakers, she wasn’t going to be looking at him from her own narrow specialty (not at all an insult to his other specialists, just the nature of the job), she was going to get data from his pediatrician and EI and analyze everything. We set an appointment for a month later with her and our otolaryngologist. 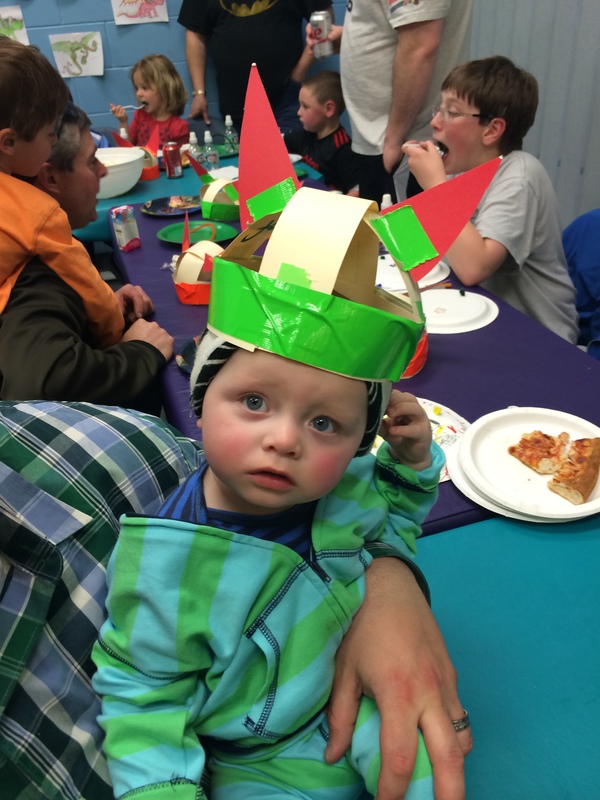 In between, Finn also started having some issues with one of his Cochlear Implants (CIs) and for the first time since he was activated, he would blink and cry whenever we put them on him. Though we were reassured that a change in program with his audiologist would probably fix that issue, it was more than a little unnerving for dan & I who (as usual) started worrying about the slight possibility of it being an internal issue that would require another surgery. Luckily, the day we came in for Finn’s other appointments, his audiologist swooped in while we were in the waiting room for the other doctors & grabbed the CIs (and Kayla whom she took with her for an adventure- and I think to give us some grown up time with the other doctor) and when we got the CIs back and later tried them out, he didn’t seem to be having any discomfort anymore (still blinking a little, but no tears! Yay!). One problem solved. The meetings with the otolaryngologist and the developmental psychologist were not so straightforward. 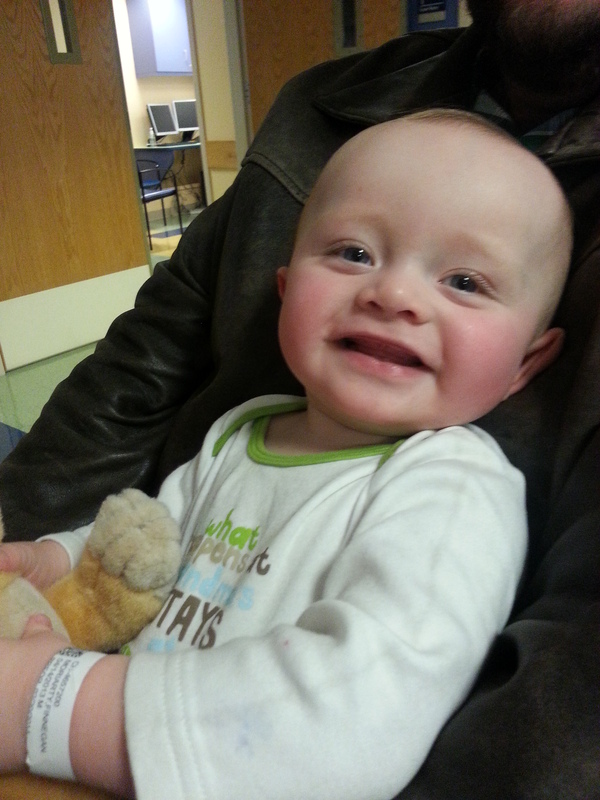 Finn’s test results came back significantly delayed in all areas on the Bayley assessment. We had been expecting low results on speech given he doesn’t talk nor sign and we thought he’d score on the lower side on motor skills, but I was taken aback by other results (such as cognitive) being low. Ironically enough, his highest score was receptive language – yes, even in the midst of finding out not great news, Dan and I got a chuckle over the fact that our deaf son’a strongest skill was “receptive language”. Well ok, what does that all mean? That’s why we did the eval, right? It means more tests and more waiting! There are still a lot of possibilities that his being born deaf + significant delays in multiple areas could mean. And there’s still a possibility that they could be unrelated (though that seems to be too much of a coincidence). There is one possibility out there that Dan and I are trying our best to educate ourselves about, but at the same time, we are trying not to get needlessly upset or anxious about. When Finn was diagnosed as Profoundly Deaf, we learned that sometimes his type of hearing loss, when more obvious reasons have been eliminated, could be due to some sort of syndrome. They rule out all of the more life threatening ones pretty early with EKGs and keeping an eye on his kidneys, but then the path goes to genetics and that is a time consuming, step-by-step process. Because insurance doesn’t want to pay for hundreds of needless tests, they have you test in groups of genetics, from most likely to least likey. In their defense, our insurance has been fantastic and it does make sense to test that way. The first two rounds for us (which take at least 2 months each to get results from) have all come back negative. But as our doctor explained, even though these are the “most common” genetics to cause deafness, it still only accounts for a 25% of all genetic causes- some of which they haven’t even identified the gene for yet, so it could be genetic and the results still come back negative. The major group of genetics they are testing Finn for right now is for the genetic marker that causes Usher’s Syndrome (click on it to learn more). Some kids who are born profoundly deaf and then show delays in areas, such as walking and other motor delays, fit into the descriptions of a kid who has Ushers. It is a genetic condition in which you are born deaf and around adolescence, you start losing your sight and by adulthood you will have a varying degrees of sight loss, but almost always at least legally blind. Ok deep breath. Scary stuff to think about. We won’t get any news until the end of October at the earliest and so we are both keeping ourselves in check trying not to dwell on that prospect too much and spend weeks with unnecessary anxiety. So what do we do until then? We bump up Finn’s therapies and get him walking (he will have at least 7 weekly therapies, 4 of which at BCH in Lexington); we schedule an eye exam and something called an ERG, in which Finn will be sedated and contacts with electrodes will be put on his eyes to test his retina; we continue his speech & language- with an extra fervor knowing that, in time his hearing could be absolutely vital to him; and, lastly, we lean on each other and our friends and our family for love and support and laughter. That last one can be so easily dismissed, but it might be most important of all. We’ve all seen a movie or read a book where a character goes into shock. Usually some sort of major trauma happens and the person shuts down, a catatonic stare on his or her face. The person usually has to be wrapped in a blanket and given sedatives to function again. But what happens when, instead of a major, instant trauma, you live inside a constant, high-level stress hanging over you for an extended period of time? I feel like that has been how we have been living for the past 14 months. Not that it’s been a bad 14 months- on the contrary, it has been filled with love and many victories- but it’s definitely apparent that our journey has taken its toll as well. The last entry I wrote months ago was Finn’s activation and I have contemplated many times that being the final entry I wrote. It had a kind of symmetry to it with the first blog being when we found out Finn was deaf and the last being the first time he heard sound, but that seems misleading. A deaf child’s activation is, in many ways, just the beginning. If my purpose of starting this blog was to keep family and friends informed and to have place where we can look back at Finn’s journey, his activation is a completely inappropriate place to end. But man, was it tempting to cut out at least one thing on the list of things to keep up with in our lives. 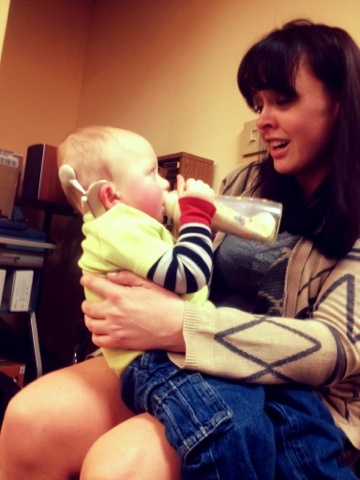 For speech therapy, he does the weekly AVT sessions and weekly sessions with an SLP. He also continues to work on his overall development and ASL with his weekly developmental specialist/Teacher of the Deaf visits, along with one class a week school at The Learning Center for the Deaf. These services mainly focus on strengthening his hearing and speaking skills. I have written in past entries about being a bit concerned about Finn’s development outside of what’s associated with his deafness. As of his 1st birthday, that concern definitely grew exponentially and no matter how many times we heard or tried to tell ourselves to “just focus on the fact that he is progressing, no matter oh slowly” was alleviating our worries. Finn at his 1st birthday with his Viking (?) helmet. When he turned one in April, Finn was still struggling to do even some basics like crawl and hold his head up for extended periods of time. We had been cleared by neurology (if by “cleared” you mean, they couldn’t really pinpoint anything solidly wrong, but knew something was “off”) and neither his pediatrician nor Early Intervention specialists could really pinpoint any issue besides “low muscle tone” though everyone also seemed to think there might be something else – whether that “something else” be major or minor, no one seemed to know. We had been trying to work on getting Finn into OT since January- thinking that maybe it was a vestibular issue (balance center, near the ear), but with no clear indicators, that option wasn’t exactly a definite solution. 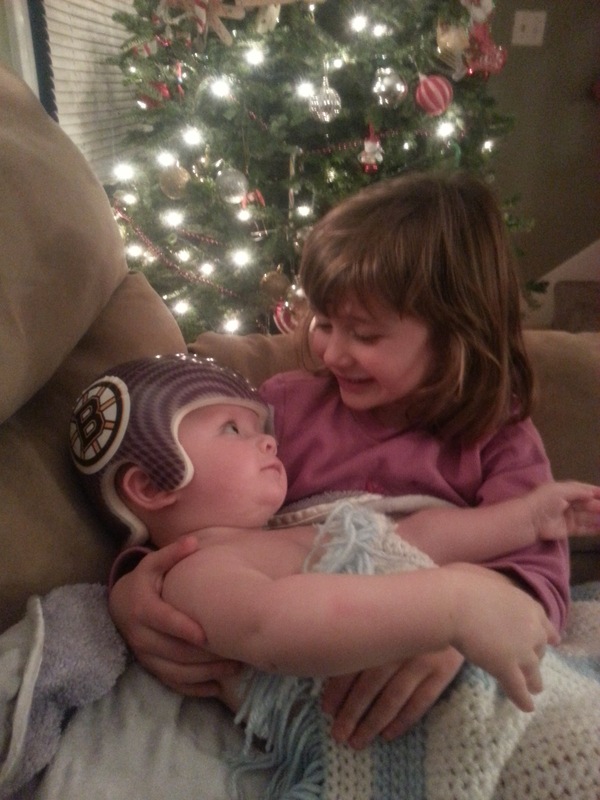 We did finally end up getting Finn into OT at Boston Children’s Hospital (our second home) and he has been going twice a week since April. He also has weekly Physical Therapy through Early Intervention. Finn playing in the waiting room waiting for OT. Since April, Finn has definitely made leaps in his development. He crawls with confidence, he pulls himself up on the couch and his crib (and over it one scary night!) and cruises along the edge of things with a look of complete concentration on his face. But still, there are things that worry us. He falls quite a lot- his body seems to work against his mind on almost every movement he makes. He rarely signs, he doesn’t even wave. His arms, back, & legs still go into hyper-extension whenever he is excited or overly happy or upset. And everyone is baffled. Opinions range from him just being delayed, stemming from his low muscle tone, to the vestibular issue discussed earlier, to a new theory of a possible Sensory Processing Disorder. With every thought about what the main issue is, we add a new strategy or therapy. We are brushing Finn with a soft-bristled brush every two hours of the day (further info about that here) and following that up each time with joint compressions to try to “reset” his sensory system. We also bring sensory play into everyday life as much as we can (most of these activities are just plain fun anyway!). 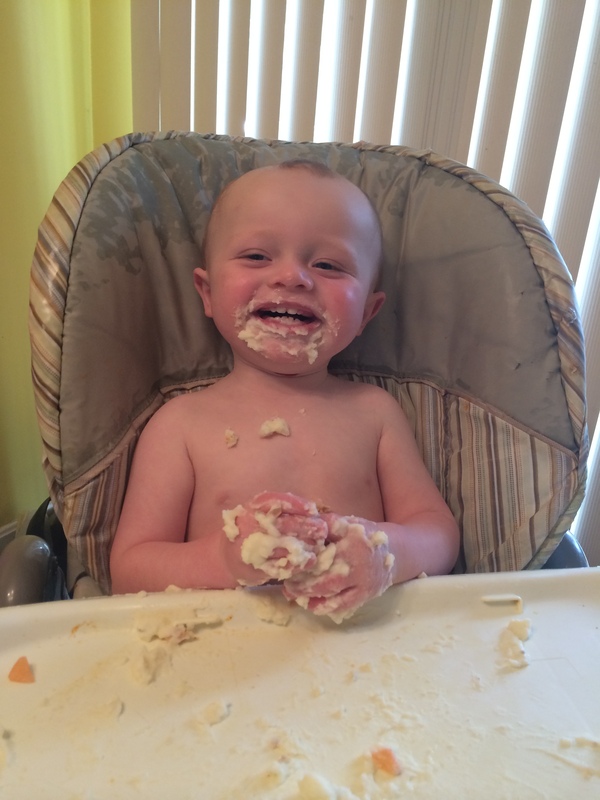 Sensory play can be as easy as Mashed Potatoes! The PT gave us a chart of activites to use, but I actually found even more on Pinterest- Sensory Play and like this list from MommyPoppins in particular: 99 Sensory Activities. We also have Finn signed up to do Hippotherapy (horseback therapy) to help with balance. 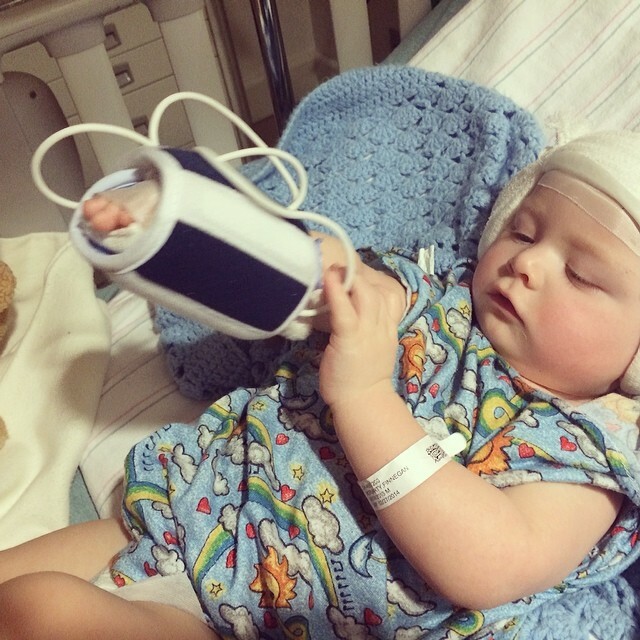 We are contemplating doing CranioSacral Therapy (click it to read what that is) in order to help regulate him – even if it sounds a bit kookie, we are willing to try anything that could help Finn out in his development. All this in addition to keeping up with his other 7 weekly sessions of therapy. I don’t say this to start a woe-is-me campaign. Parents do whatever it takes for their child and a few therapy sessions a week is nothing compared to some. For me, the bigger layer of stress is not knowing when/if the other shoe will drop. We still have no idea what caused Finn’s deafness and as I have written about before, getting blindsided by that news when Finn was born, has probably made me extra-sensitive to this feeling of foreboding, but until there is some concrete explanation for the global motor delays we are seeing in Finn, there will be a very real fear about finding out that something else is seriously wrong. Questions plague my mind constantly: Why doesn’t he seem to have neck control all the time? Why do parts of his body fatigue SO quickly? Why can he use fine motor skills to pick up a grain of rice, but then have trouble bending his elbows to pick up his milk? Why can’t he bang two toys together without a lot of guidance and help? Even things that most parents would probably write off, cause concern: Is the fact that he still wakes up at least once a night a symptom or is he just a bad sleeper? When he cries so hard over something seemingly small, is it just because he is deaf or is he super sensitive to something? This week he woke up with a couple of bug bites- granted they were pretty huge and firm- and I wanted to rush him to the pediatrician because I thought maybe they weren’t just bug bites, maybe there was something more to them! After calming down and thinking rationally and seeing him in one of the best moods in a long time, I felt better, but it’s little, constant concerns like this that add up. Don’t worry, most days we are not sitting here brooding over what may come! Most days we are enjoying seeing Finn grow and learn and seeing he and Kayla start to really play together and seeing them bonding (the very tight bond it is for such young ages) and appreciating what we have available to us that wasn’t available in the past. His MAPping sessions have gone really well. Each session, he has made progress and has been “turned up”. After his May session, he was finally on a program that had an obvious effect on his every day hearing. That is one thing that I’d want other CI parents to know. After activation and even for the first couple of MAPping sessions, most of the sounds (at least in our case) were still not that accessible to Finn. The programs are kept really low at first, so that the kids gradually hear more and more. It wasn’t until the May session that we started noticing that Finn would turn to our voices in the room or noises that were further than just a foot in front of him. As with everything else, it is a marathon, not a sprint. Finn at a MAPping session. 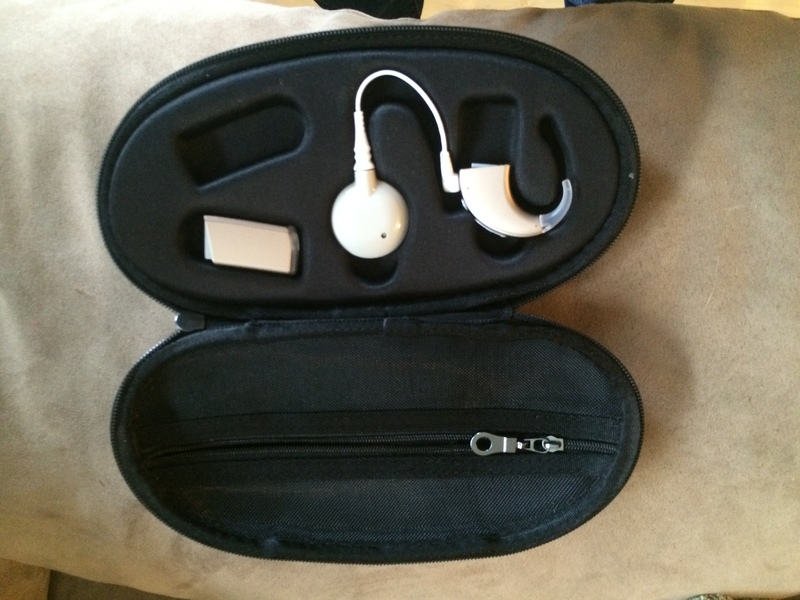 His audiologist is very, very happy with his progress and we are extremely happy we went with Advanced Bionics. Finn bit through one of his processors and another one of the batteries broke mysteriously and AB replaced them OVERNIGHT. We also had a bit of a conundrum when trying to figure out how to keep the CIs on Finn’s heads. Wear time is SUPER important (he can only learn to hear if he is actually hearing) and we went through a few different things before finding something that worked for us. A lot of people use the shirt clips when the kids are so young and those are probably absolutely fine. One small downside is that then the sounds the kids are getting are coming at them from their back- that’s where the clips go. So it would be like hearing with your shoulder blades. This is not a huge deal, but Dan was determined that he could make something that would make it so Finn would hear from a more “natural” direction. We tried wig tape to keep the processors behind his ears, but that was too painful for us to be taking off and putting on everytime he was napping/sleeping. We were also having a hard time keeping the magnets from falling off, especially when he was doing OT or PT and was on his back. Dan did a little research online and found these headband things that someone was selling (for quite a lot of money) in Australia and figured he’d give it a whirl. This resulted in Finn’s bling. 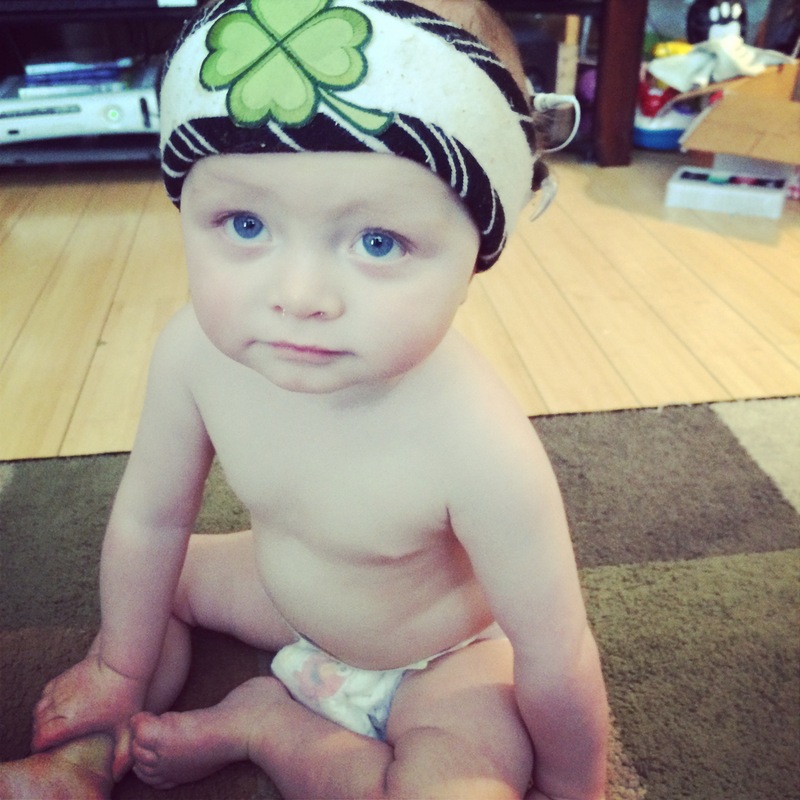 Showing off his Irish pride. A more lightweight design that allows the processors to face forward to catch the sound better from a person speaking directly at him. Finn is very lucky to have a dad who was thoughtful and clever enough to come up with this (god knows I can barely thread a needle!) and who has given over all of his week days to Finn while I am at work. I hope to be a bit more useful over this summer break! Next steps include continuing everything we have been doing, booking an appointment at Children’s to do a full developmental assessment, more genetic testing, and a neurology follow up. My hope is that by the end of summer we either have some answers or the services we already have in place have made a significant enough impact on his development that we can breath a little easier. Happy Summer, Happy 4th everyone! Finnegan is activated! 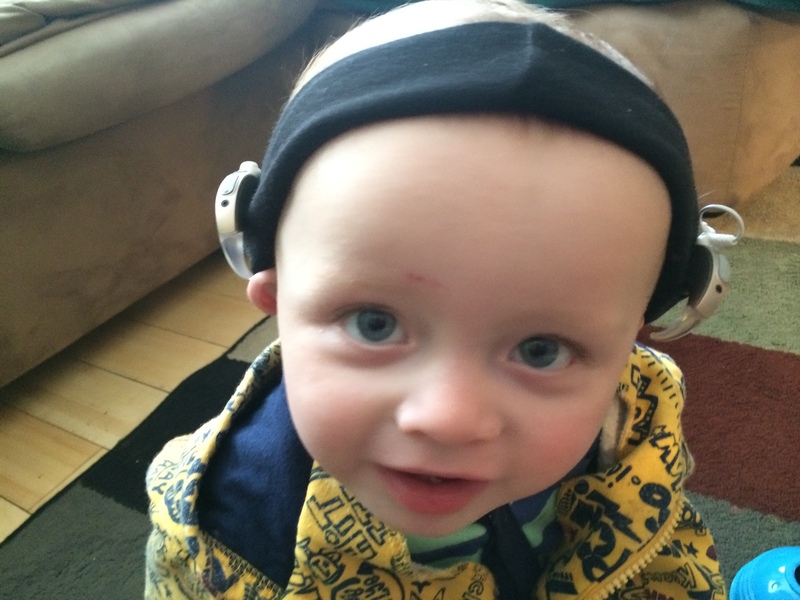 His Cochlear Implants were turned on Friday, March 14th. It has been a packed couple of weeks since then so it has taken me a while to write about that special day and the special days that have followed. The morning of the 14th was filled with happy, nervous stress. I think there was more emotion surrounding this day than the day of the surgery. Where the surgery was pretty much limited to anxiety and worry about complications, this day came with a sense of anticipation that we couldn’t really put into words. Take that feeling you had when you were a kid on Christmas Eve and multiply it by about a billion and that might be the closest I can come to explaining it. There was also some fear in a way. What if something went wrong? There was absolutely no scientific reason for us to worry that it wouldn’t work, but that didn’t stop us! Dan, my brother (also Dan), Finnegan, and I drove down to Children’s Hospital in Waltham around noontime- this will be the office that we will spend the majority of Finn’s visits until he is an adult; seeing as we will be going in every 3 to 6 months, it’s very convenient not to have to go into Boston each time! This visit might have been the first doctor’s appointment that we’ve ever been watching the clock waiting to LEAVE and not watching it and counting how many minutes late we would be haha. We arrived at Children’s for the appointment that would change Finn’s life forever…below is a video I put together of the appointment- I know many people saw the raw footage on Facebook, so I made my first attempt at video editing and created a video that I hope helps people understand the process better than just the long-winded annotations I had on the original post. Enjoy! After posting the original video on Facebook, we had an overwhelming amount of responses. We want to thank everyone for their encouragement and for sharing in our family’s special moment. One thing that I found interesting about myself was that on activation day, when so many other people were sharing with us how they were moved to tears by the video of Finn, I had yet to have that outpouring of emotion. I don’t know if I was still taking it all in or what, but my moment didn’t come until that Sunday. I was up at 4am with Finn (he decided he wanted to play at that time!) and we were hanging out together. I put his CIs on and turned them up to the next volume level as the doctor had instructed to do when he woke up on Sunday. Right away he clapped and smiled, as if he had been waiting all night to try out that hearing thing again: ) So we started playing and he accidentally bit his own finger. He started crying really loudly so I did what I usually do- bounced him a bit, signed to him that he was going to be okay- and then it hit me; I could sing to him and he would hear me! I started singing the same lullaby that used to soothe Kayla at that age and he immediately stopped crying, grabbed my face with his hands, pulled me in really closely to his face, and gave me the BIGGEST smile and started giggling like crazy!!!! That moment will be burned into my memory for the rest of my life. I just started bawling my eyes out, trying to maintain the lullaby, and then he’d smile again and I would lose it again! Right after that happened, it inspired me to experiment with other music. 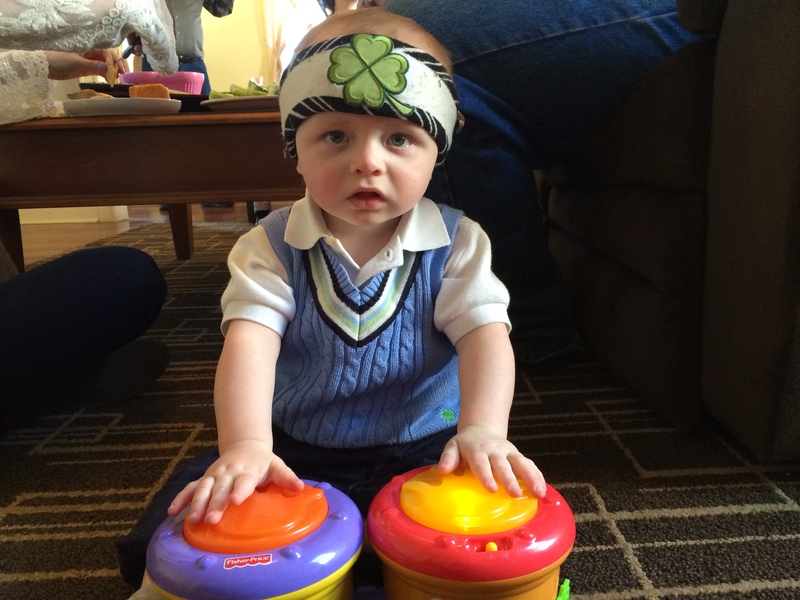 Unlike some babies with hearing loss, even with his hearing aids in, Finn never picked up on any musical notes (or any sounds for that matter) that we know of- something that was very hard for me with my love of music. 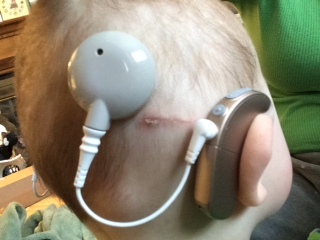 After seeing his reaction to my singing, I remembered someone recently saying online how the newest Cochlear Implants, the ones that Finnegan has ( Naida CI Q70 ) is the first CI that makes music actually sound like music. In the past, even with CIs, the quality of music for a lot of people (or so I have read) was extremely poor. The video gets cut off because I jumped up and down with excitement, but you can see the HUGE grin on his face! This reaction is from a kid who NEVER before today paid any attention to the T.V. or computer no matter how colorful or exciting it looked. The morning only got better when Kayla walked down the stairs and came up behind Finn and said “Good Morning, Finnegan!” and he turned to her and smiled! It might seem like a small thing, but for him to acknowledge someone new is in the room is such a big deal to us. The following week was filled with a new surprise and discovery every day. 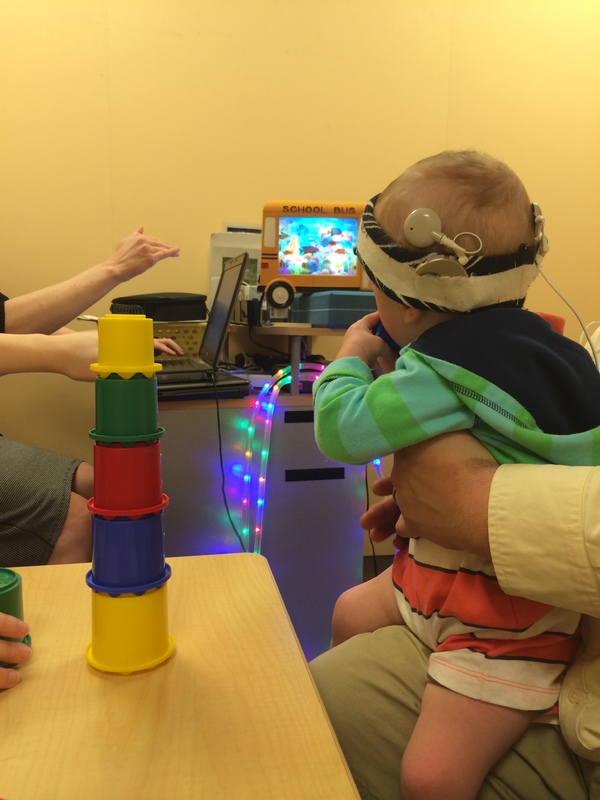 By that Thursday during his AVT Speech Therapy session, he was already mimicking one of the sounds – after just 6 days of hearing!! The therapist was extremely impressed with his progress, and we are so proud of him and, I have to admit, proud of ourselves for sticking with all the pre-therapy, even though at times it seemed really ridiculous to be doing speech therapy with someone who couldn’t hear. It was definitely beneficial though and we are seeing those benefits now. The last few weeks have not exactly been easy between the surgery, the dreaded MCAS testing at school, recurring stomach bugs and head colds, and this never-ending winter, but it has been very easy to get myself out of any bad mood by taking about 30 seconds to think about the absolute miracle of a gift our family has been given. What a world we live in that a person can be born deaf and then have a computer implanted in his brain to make him hear again! It is way to easy for me to be dismissive of modern technology and take it for granted when I can do just about anything, anytime by pulling my phone out of my pocket, but when I really stop and think about how different our lives, Finn’s life, would be 50 (or even 15!) years ago, it astonishes me. 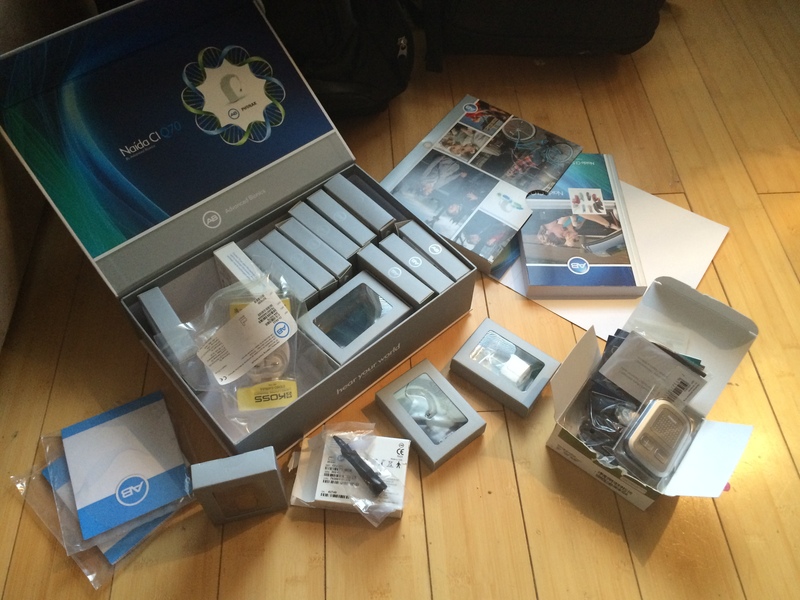 Tonight I leave you with some pictures of the “swag bags” from Advanced Bionics (the backpacks filled with a billion pieces and parts for the CIs) and some of Finn over the last couple of weeks. A still picture of Finn’s activation and listening to me in the first few minutes of hearing. Handmade band- made by Dan – to hold the CIs when nothing else was working! 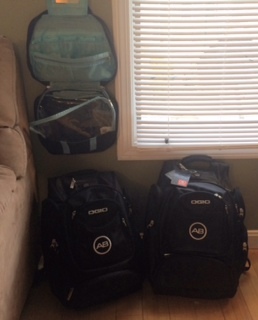 Swag Bags from AB FILLED with pieces and parts for the CIs and a hanging organizer to keep everything straight. Battery charging and processor drying station. 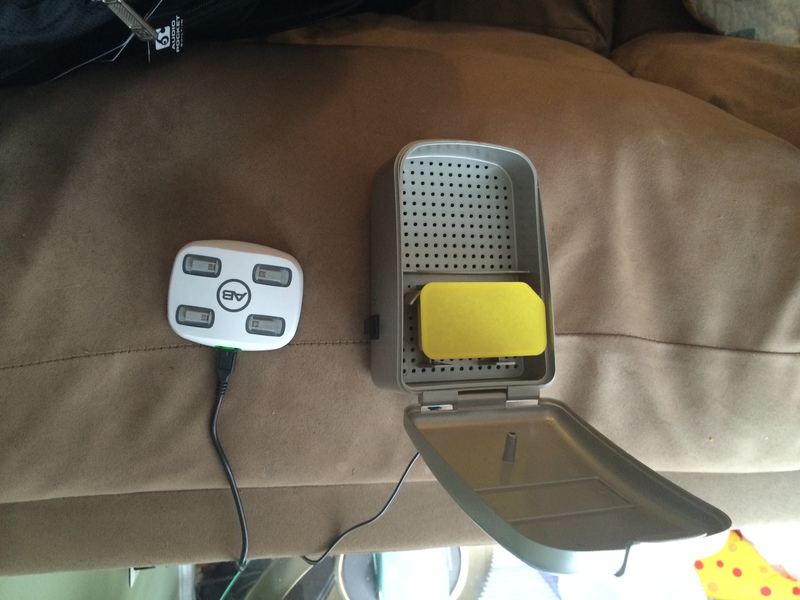 The Zephyr is like a super-high-tech electronic dehumidifier. Pretty cool. 1st attempt at keeping them on his little ears- wig tape. Would’ve been more effective if he didn’t nap so often and have to have it replaced. Not very cost effective, nor gentle on his skin. One or the two boxes of parts and pieces for the CIs. Handy dandy (and durable!) carrying case. The purpose of this particular post is mainly to give other parents out there who are going to have their child implanted a look at our experience. I think from the 4 bazillion Facebook/Twitter updates Dan & I posted throughout the weekend, our family and friends have a pretty good idea of the events already, but this will hopefully give people who are in a similar situation as we were an idea of what to expect. Disclaimer: this is our personal experience. 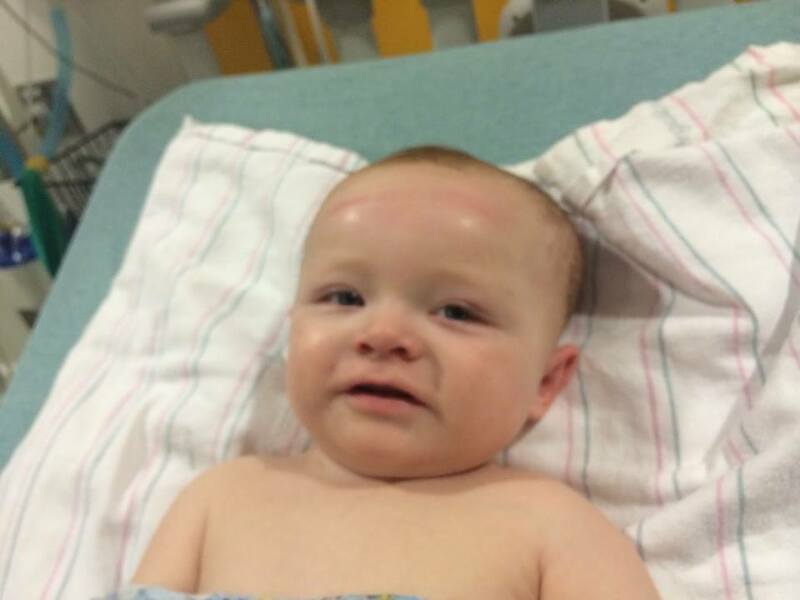 We are at Boston Children’s Hospital, our son is 10 months old, and structurally his ear is 100% normal. I state this because any one of those details, and probably hundreds more, could make this experience very different for others. 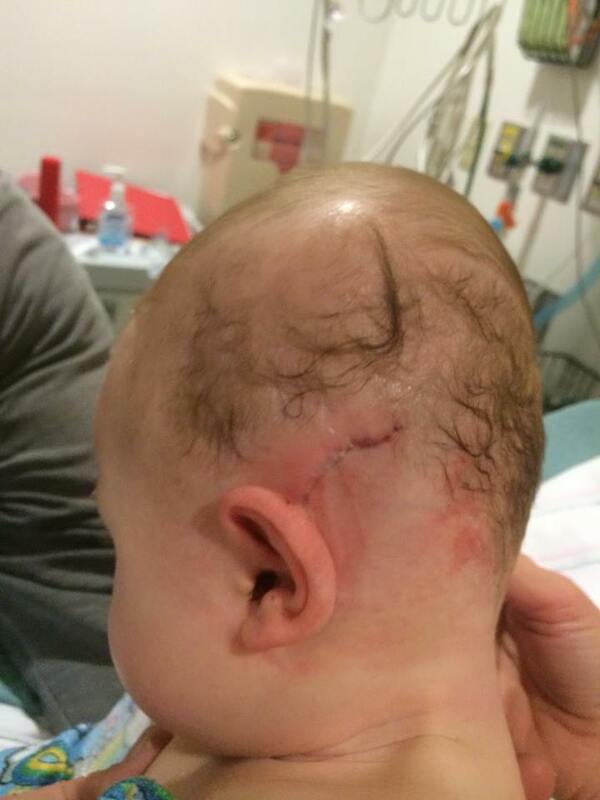 Here, we share our story to give you a rough idea, but please keep in mind that every surgery, like every kid, can be different. (I leave out the names of all our doctors on this blog, but email/message me if you would like our surgeon’s name because he is AMAZING!). The week, and especially few days, leading up to surgery day was rough. The stress and worry weighed very heavily on our shoulders. As confident as we were in our decision, it was still a hard pill to swallow that we were choosing to have our child have his skull drilled into and his brain messed with- that is putting it harshly, but it is how we felt. This is probably the reason we decided to pack what seemed like enough to travel across Europe for 3 months. Ha! One word of advice: don’t over-pack! Especially for the baby. They had EVERYTHING we needed there (formula, diapers, wipes, etc.). He really didn’t need any clothes except the PJs he went in wearing since he was in a Johnny the whole time. As for you as parents, you are not going to care how you look in the morning, believe me. Last minute sibling hugs & kisses before we hit the road. So, we set out at about 6:30am (had to be at check-in at 8am for a 9:30am surgery). Finn couldn’t eat past midnight the night before and no formula since 4am, and clear liquids stopped at 7am. I was worried he’d start getting really cranky from being hungry, but he held out pretty well. From 8a.m. to about 9:45am (running a little late) we met with almost every doctor and nurse who would be part of Finn’s surgery team. Each was patient and informative and asked us if we had any questions. Once again, we felt less like we were in a hospital with strangers and more like we were with close friends chatting about our son. He had smiles for everyone pre-surgery. Playing Peek-a-Boo while we waited to start. The surgeon estimated about 6 to 6.5 hours for the total surgery, which got pushed back to about 10am. When the time came to say goodbye; that was the moment that was the hardest for me. 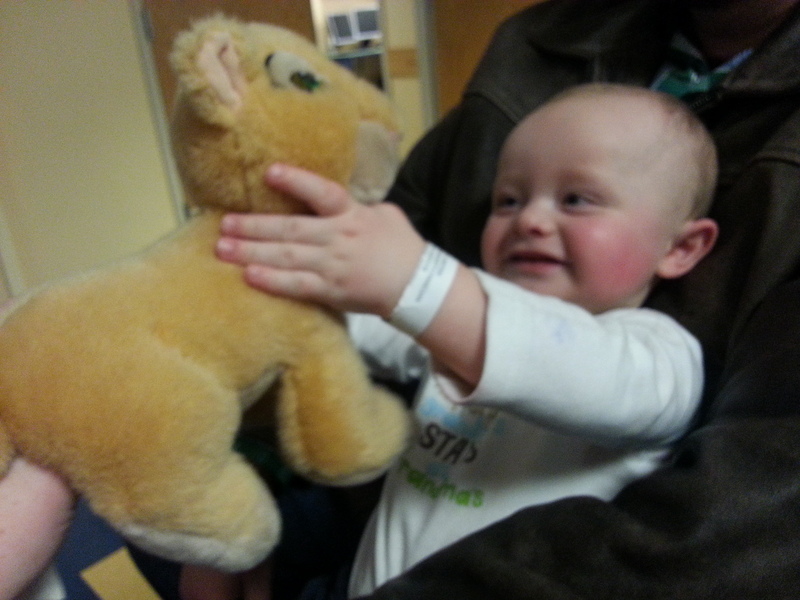 Dan and I had chosen for him to be the one to take Finn in the operating room while Finn underwent anesthesia. I was left alone in the pre-op area and had my own private break down. There is nothing that can prepare you for that moment. Dan had a different kind of hardship on his side going into the operating room. He suggests for parents who do go in the room, have your good-byes ready because you walk in, you see all of the menacing looking instruments they’re about to use on your child, then they give the anesthesia and he said it just felt unnatural to watch Finn’s eyes glass-over and him fall asleep like that, then they rush you right out. We were taken down to the waiting area by a nurse and introduced to the liaison nurses. These women were our connection to what was happening with Finn throughout the whole surgery. Every hour or so, they would walk down to the waiting area to give updates on his progress, but they also took our cell phone numbers just in case we wanted to step out and get some air or grab a bite to eat. Anyway, it’s going to be a long day. Everyone knows that. It is a day filled with tension and fatigue. I was lucky enough to find a couch to crash on for a little bit and the nurses took pity on me and found me a super comfy pillow and blanket. I repaid that kindness by proceeding to fall into some sort of coma-like sleep where indecencies like snoring and drooling apparently had no limit (this is according to Dan, I think he may be exaggerating). We also had our laptops, Kindle, smart phones and used distraction as our defense. Well the check-ins kept coming, we kept people in the loop via what must have become a tiring amount of Facebook updates for some people, and we waited and waited. Finally, when all the other families had come and gone, we saw our surgeon walking down the hall! The surgery had lasted about 8.5 hours. 2 hours longer than scheduled, but the reassuring smile on the surgeon’s face (not to mention the updates from the nurses) put us at ease. 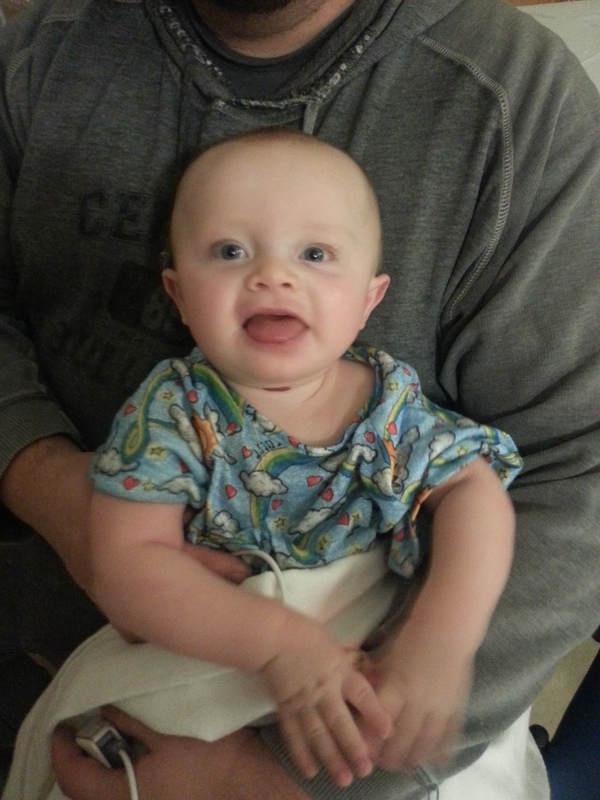 Dr. L had said that Finn was doing great, the surgery had gone off without a hitch and he would be in recovery shortly. He had said that his canals were really tiny (not surprising given his age) so he had just taken his time and gone very slowly with the procedure, hence the extended time. We were happy to hear it went well and felt happy that he had taken his time. Not the sort of thing you want people trying to rush at! “Both auditory nerves tested ROBUSTLY!”. What a word. Much like the word “profound” will forever be connected to hearing Finn’s original diagnosis of Profoundly Deaf, the word “ROBUST” (as I see it in my head, it is always in all-caps) will always be linked to the moment my baby boy “heard” for the first time. 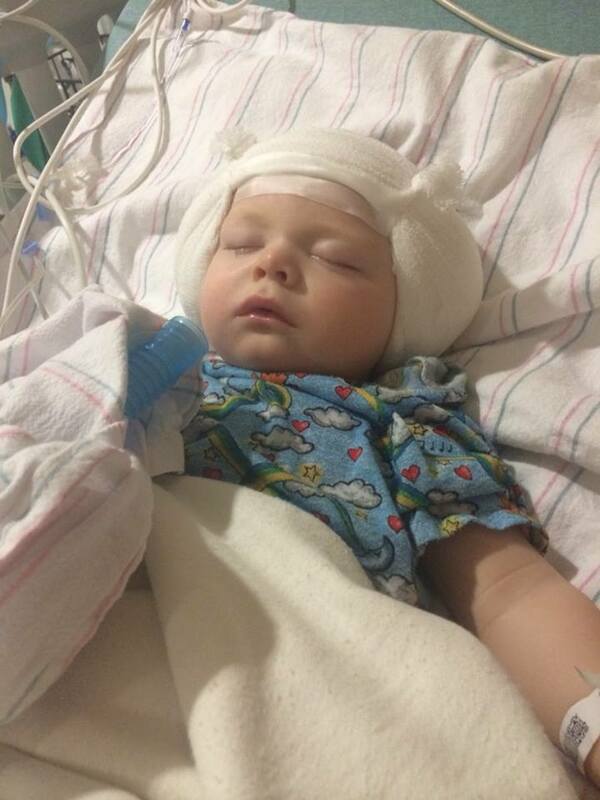 He might’ve still been under anesthesia and it might have just been some high-techy sound wave, but on February 27th, 2014, Finnegan Daniel Moriarty’s auditory nerve fired- ROBUSTLY- and his brain heard a sound. The high of that moment is hard to retell in words. The high, however was quickly countered with the nervous expectation of what Finn would look like when we saw him in recovery. Both Dan and I had done so much research (Dan actually watched an entire CI surgery online- and people say I’m the crazy one in our relationship!) and we were told to expect a lot of swelling, bruising, and in general, a very banged-up looking little baby. I remember grabbing Dan’s hand and he just looked at me and said, “brace yourself.” Well, I don’t know if we had psyched ourselves out with too many Google searches or if Finn’s body just took the surgery well, but I was amazed at how not-too-terrible he looked. Finn in recovery right after the surgery. The thing we weren’t expecting was the elevated heart rate. 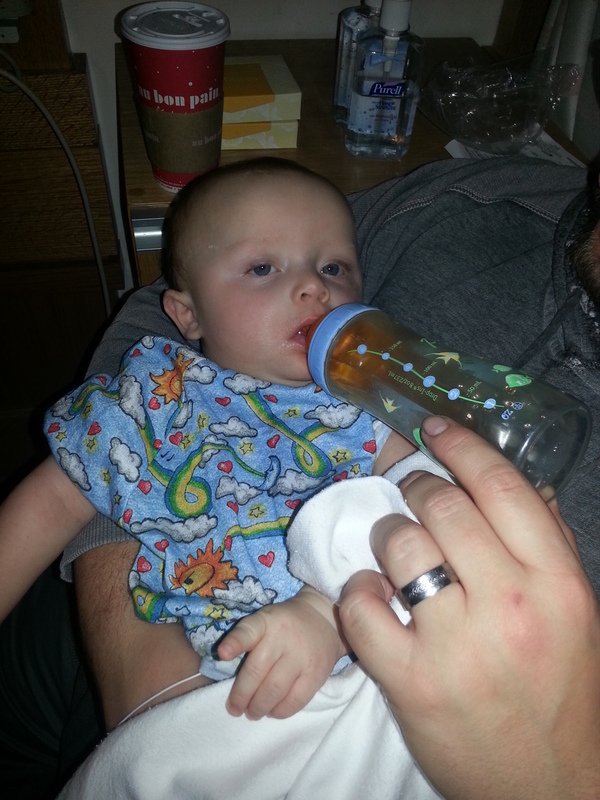 I guess it is naive to think once the surgery is over, you are in the clear, especially given then he is only 10 months old and was under anesthesia for over 8 hours, but it was difficult to have already taken that breath of relief only to find out that it may have been taken prematurely. Finn was never in any “danger zone” as they called it, but his heart rate was at 200+ and his blood pressure elevated for about 2 hours. They maxed him out on morphine and the nurses called in a couple of other doctors, none of whom seemed overly concerned (which was a good thing), but all of them were keeping a close eye on him. Luckily, the night nurse came in at some point to meet Finn and she told us and the other nurses that she had had a 14 month old a few weeks before, same surgery for a similar length of time, and his HR had been elevated all night. This seemed to calm everyone down as it set a precedent and so this wasn’t a completely abnormal reaction. Shortly after that, our worries were alleviated any way because his stats fell back to normal and we even had him smiling and laughing! Laughing at the balloon daddy got him. He was restricted from eating still because he had vomited right upon waking up and you could tell he was getting grouchy from not eating. They were limiting him to sugar water and he was starting to push it away angrily when the night nurse came in and started signing to him in ASL- so cool! 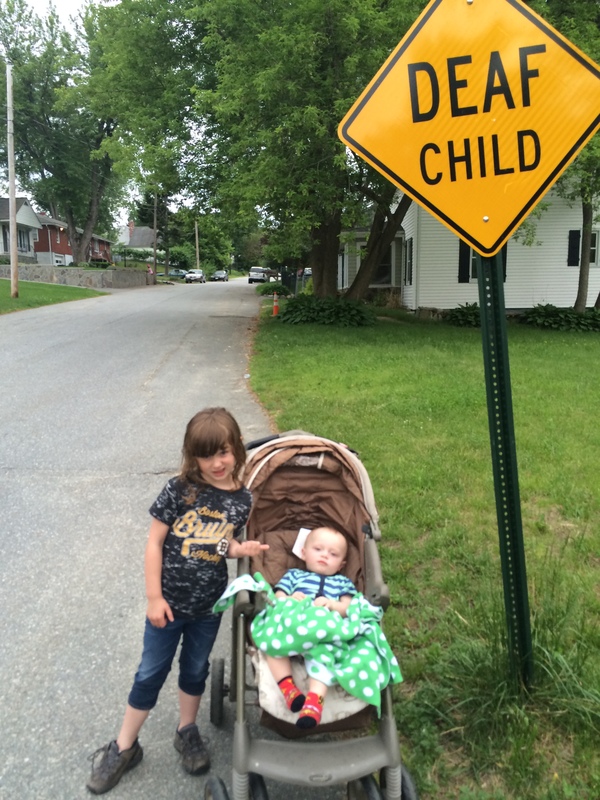 (she had learned some signs when her kids were babies). Finn must have taken that as an invitation to speak his mind because he VERY clearly signed “EAT” right to her! He was so adamant, the nurse looked at me & said, “Ok, maybe we can try half-strength formula.” hahaha. Go Finn! Already learning to advocate for himself! When he was finally settled down for the night, Dan had to leave- they gave him the option to stay, but they are only allowed to provide 1 parent seat/bed thingy and they conveniently have a house down the street where parents can stay for very low cost. I think it is meant for more long-term parents, but there was no way either one of us was going to be 45 minutes away from Finn that night and they were nice enough to offer it to us so we didn’t have to spend money on a hotel room. All night long the nurses perfectly balanced checking-in on Finn (& me too because they are so sweet) with letting us get rest. Well rested after a good night’s sleep in the hospital. In the morning, the doctors came to check up on his healing and by 10am they were removing the pressure bandages. Finn laughing as the doctor removed his bandages. Decided to take matters into his own hands and he ripped the forehead bandage off himself (hence the red mark! ), but he was smiling proudly when he did it. Once again, we were pleasantly surprised with how Finn looked. 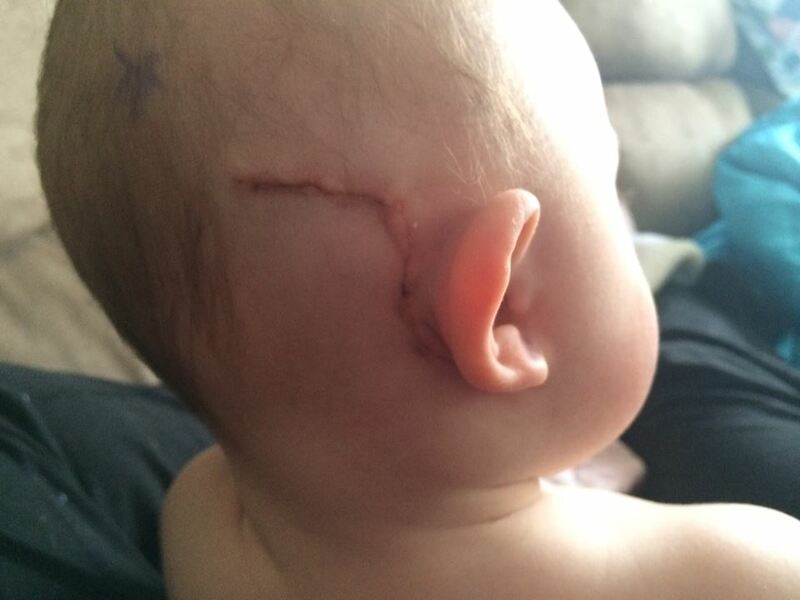 I was expecting huge, thick lines up the sides of his head, but they did the sutures internally so it was fairly clean. And not only do they dissolve on their own, but it is also a much fainter scar. They say it will be unnoticeable when his hair grows in. They sent us home around noon that day (unbelievable that it was only about 18 hours after an 8-hour surgery) with antibiotics and a regime for alternating Tylenol & Motrin every 3 hours- very weird for people who really aren’t big on giving medication when we can avoid it to be giving so many meds. They didn’t give us any pain meds to take home because he hadn’t needed any since the night before, but they said we could call them any time if he seemed to need them. Leaving Children’s looking a little drugged out. The return home took an unexpected turn when we found out that poor Kayla (who is very rarely sick and has been in perfect health all winter) had been throwing up all night and had a 102 temperature. I felt so badly for her because this had been a pretty huge event for her as well and her stress was compounded by this bug. It was also very worrying to us to have Finn exposed to whatever she had while he was recovering, but we did our best to keep him protected. 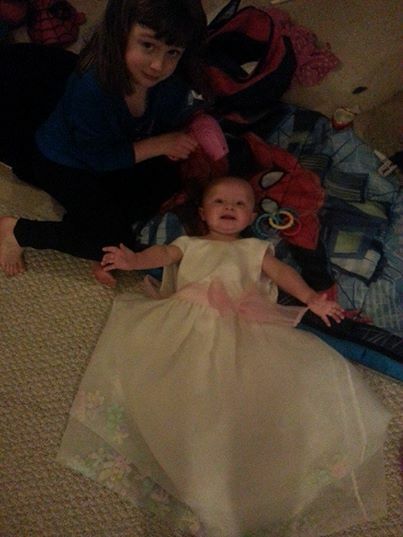 This was the only way we could let them get their together time, but they made the best of it! The first 24 hours home was pretty rough. Dan was beyond his limits of exhaustion, Kayla was still really sick, I came down with a head cold and in my sleep-deprived haze took a tumble down a flight of stairs (“Shoulda held the railing like you are always yelling at me, mom”- says Kayla as I lay at the bottom landing). Finn didn’t sleep more than an hour at a time, and usually it was more like 20 minute cat naps. By midnight Saturday, we were at our breaking point. We were giving it until morning and then we were calling in for pain meds for him and I was trying to decide if it was worth an E.R. trip for Kayla since her fever was still high whenever the medicine wore off. All set with this weekend! Luckily, Sunday was a turning point. Finn finally started sleeping, Kayla’s fever broke, and Dan and I got some rest. We even got Finn weaned off of the Tylenol/Motrin by Sunday night. Monday was continued improvement all around. 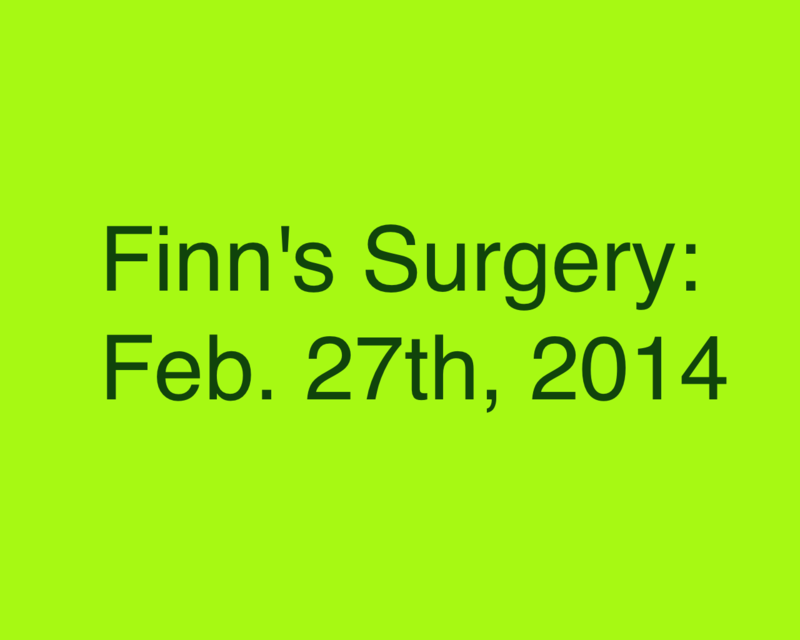 Today was Finn’s post-op appointment with the surgeon. Dr. L said he looked great. Oh, this is important for post-CI parents out there. He was adamant that ANY ear issues in the future be treated aggressively. A lot of pediatricians hold off on treating ear infections with antibiotics these days because it can so often be viral and the meds wouldn’t do any good. But Dr. L said kids with CIs need to have every ear infection symptom treated immediately and aggressively with heavy duty antibiotics. 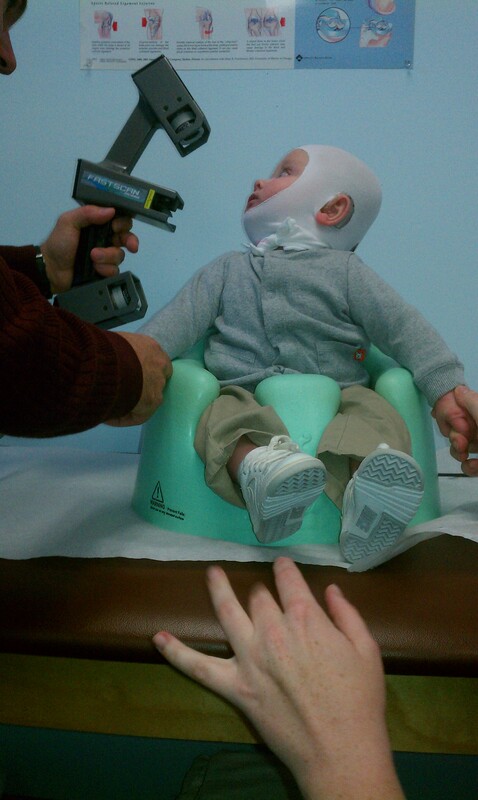 He even said that if the pediatrician hesitated, he would call them or he’d just prescribe the meds for us right away. Finn’s ears will be checked on such a regular basis, I’m not too worried, but it is good information to have. Today Finn seems to have taken a slight step back- he had a low, low grade fever and has been kind of cranky and VERY sleepy all day. We did end up putting him back on Motrin which seems to be helping (maybe we weaned him off too soon? ), but between the viruses floating around here, some new teeth coming in, and being only 5 days post-op, we’re not overly worried that the kid is tired! Tomorrow is my first day back to work, Kayla’s first day back to school, and the first day that seems like we will be getting back to “normal” (always a relative term with my family). Even though it has been an absolutely emotionally and physically depleting few days, in a way it has been a very rewarding time to be able to be with just my little family (mainly because we quarantined ourselves ha) and do lots of cuddling and coddling. We have all been superstars in our own way and I know that our strength comes from the strength we give each other and we get from our friends and family. Now we get to look forward (not worry about) the next few days because it is TEN DAYS UNTIL ACTIVATION! Yes, we are planning on filming it (my brother – the Go-Pro director himself -has offered to do this for us) and we’ll share it with you all as well. On that note, I want to end with an enormous note of gratitude to all of our Team Finn supporters! 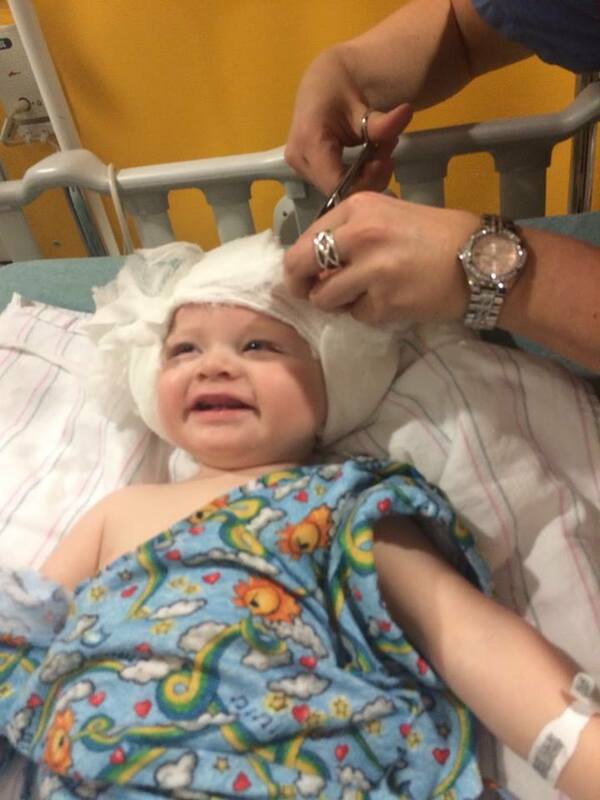 Thank you to all the doctors and nurses at Children’s: your level of care & support is on a level of its own. Whether it was e-mails on surgery day cheering us on or sneaking me a blanket “right out of the oven” while I stayed overnight, you will always be more like family to us than just health care providers. Thank you to all of Finn’s specialist who are basically helping us raise Finn and making sure he reaches his full-potential. Thank you to my colleagues who make me feel like everywhere I turn at school, I have a shoulder to cry on or a hand to help me out. Thank you to my family on both sides, near and far- a special thank you to Yia-yia & Aunty Kathy for taking care of sick Kayla when I couldn’t be there, and thank you to the HUNDREDS of people, some we know, some we’ve never met, who reached out to us the week of Finn’s surgery sending us an incredible wave of positive energy. We look forward to sharing this next, EXCITING part of our journey with all of you. 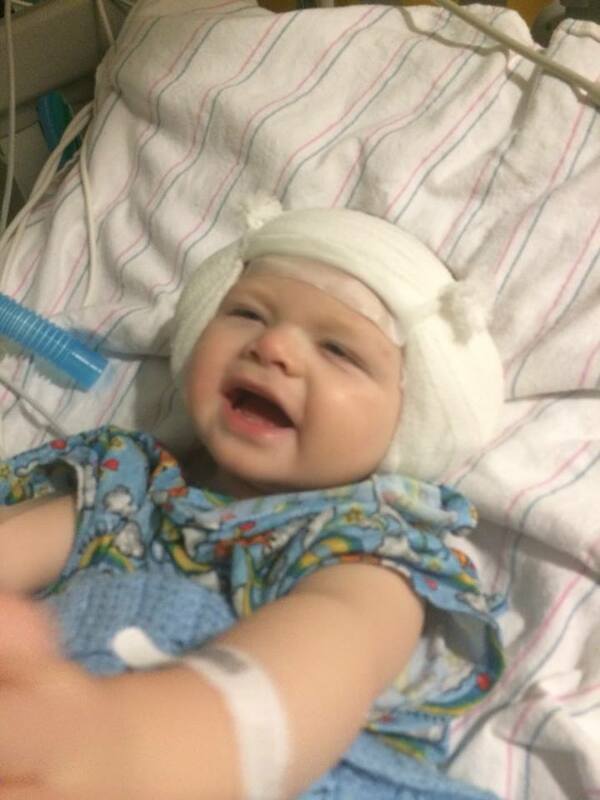 Finnegan Daniel, 10 months old, 1 week pre-CI surgery. 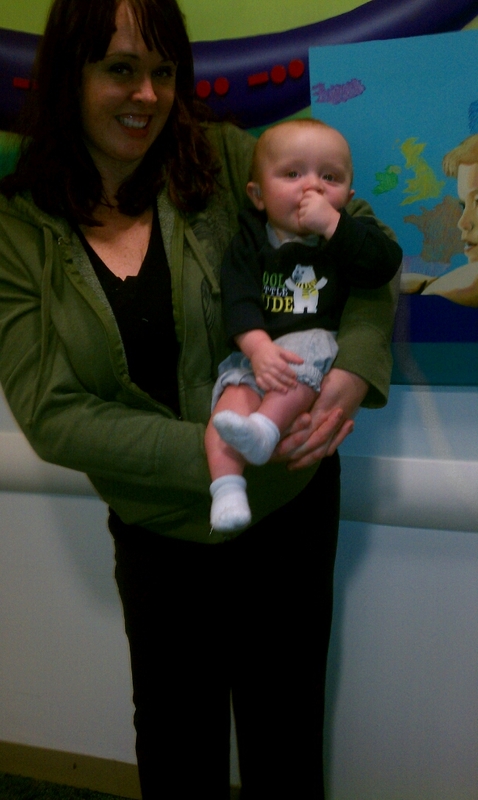 At Boston Children’s Hospital for his Pre-op appointment. 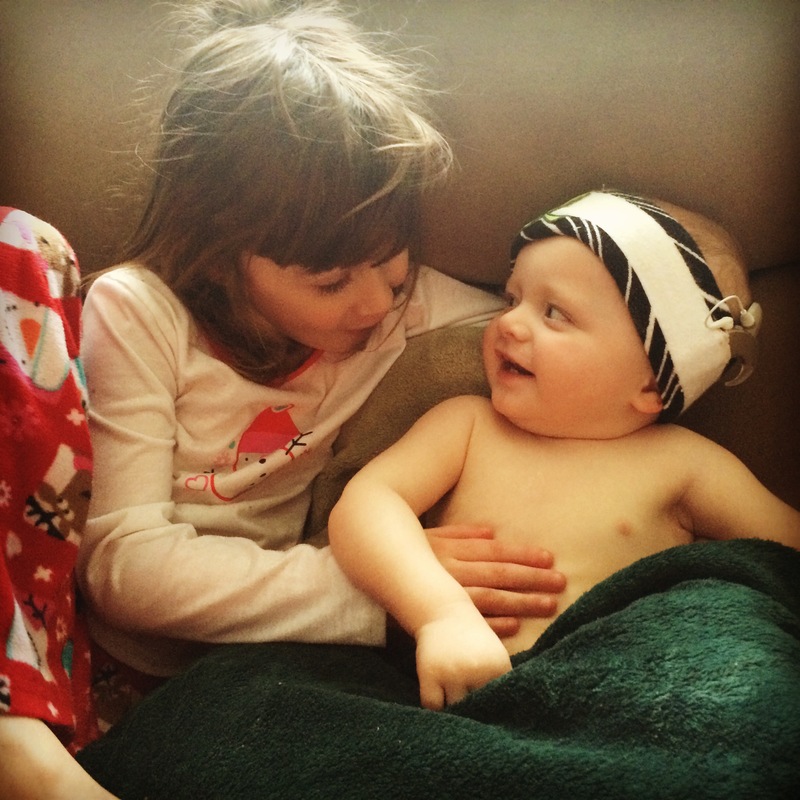 FOUR DAYS… four days until Finnegan has his Cochlear Implant surgery. We have been anticipating this day for just about Finn’s entire life and it’s incredible to look back over the months of appointments, research, & decisions and know that it will come to fruition this week. The surgery is scheduled for Thursday -we won’t know the time until Wednesday afternoon, but they said it could be as early as 7a.m. so we are looking at a 4a.m. departure time from Casa de Moriarty. 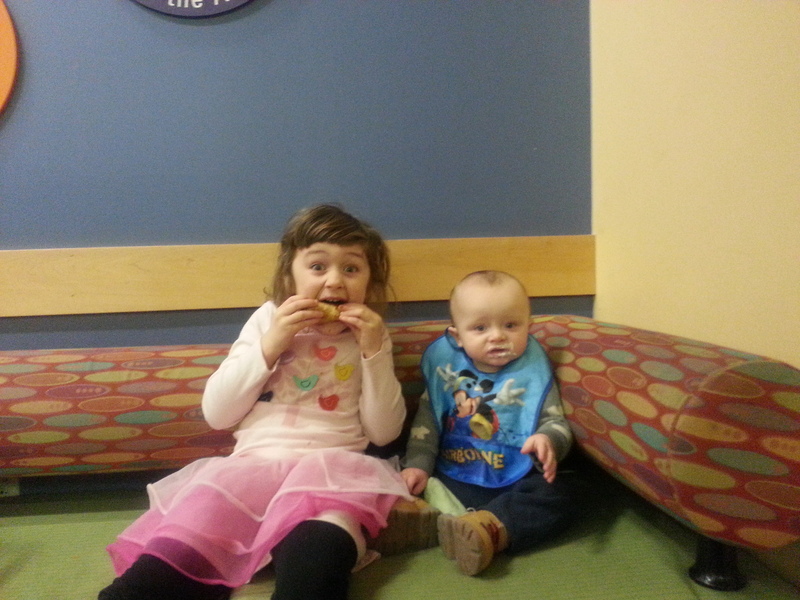 Enjoying some Au Bon Pain breakfast in the lobby of BCH before our appointments. 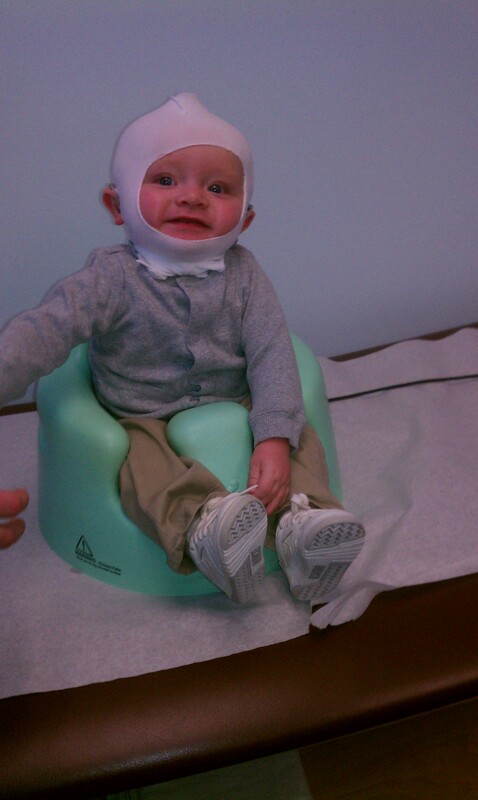 The pre-operation appointment went really well on Thursday. It was sort of like a dry run getting packed up and into Boston that morning- though probably only a tenth of the apprehension as we’ll have next Thursday- but it went well, we didn’t have too many questions for them or find out anything really new, but I suppose that is a good thing at this stage. 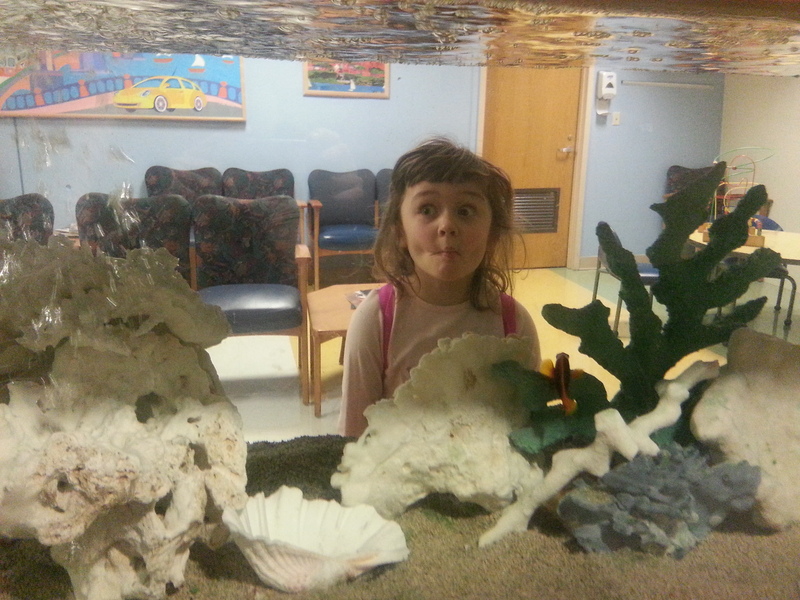 Loving the fish tank in the waiting room. We brought Kayla with us so that she could have an opportunity to meet the doctors and nurses who will take care of Finn and try to calm some of the worries she has had, but once we got there it was all about the café, fish tanks, and making friends. I do think it will be nice for her to be able to picture the bright, cheerful hospital and remember the staff who treated her so special come Thursday when Dan and Finn and I are all staying over the hospital and she is back home. 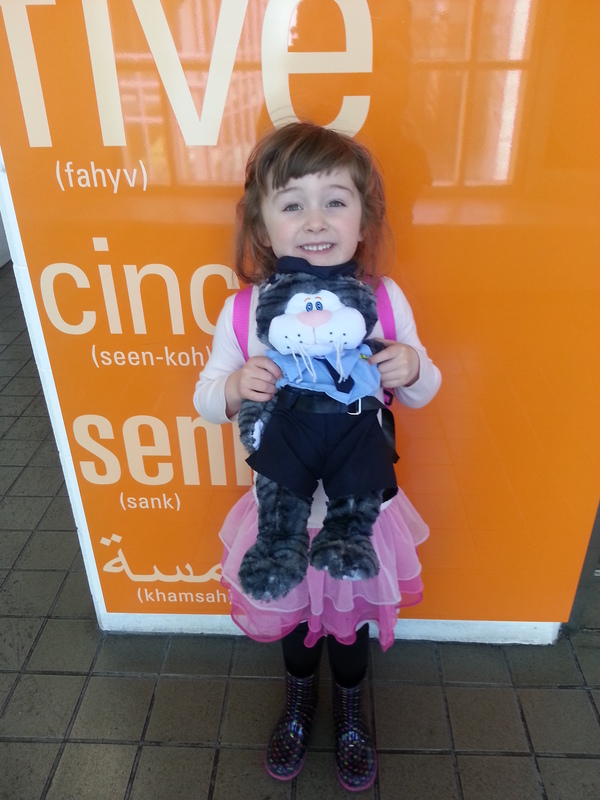 Children’s staff made her feel special all day, topping it off with this super soft Police Cat to take home. As much as the surgery is the central focus for us, Finn has a lot of other things going on for him that have divided our attention a bit. I wrote in the last post about the concerns about some of his developmental delays and mentioned that a plan was being formed to address these things. Since that post, we certainly have added to his regimen. On Mondays he continues to go to TLC- school for the deaf. Tuesday through Friday, in addition to the developmental specialist for E.I. coming once a week, he now has weekly visits from a general Speech Therapist, an AVT (AVeD) specialist, and a physical therapist. The speech he needs for obvious reasons, but after his evaluation from E.I. we decided we needed to put more focus on his physical (gross motor) development. The specialists aren’t really sure why Finn is a bit delayed in this area, but they’ve recommended we get a consultation with a neurologist. 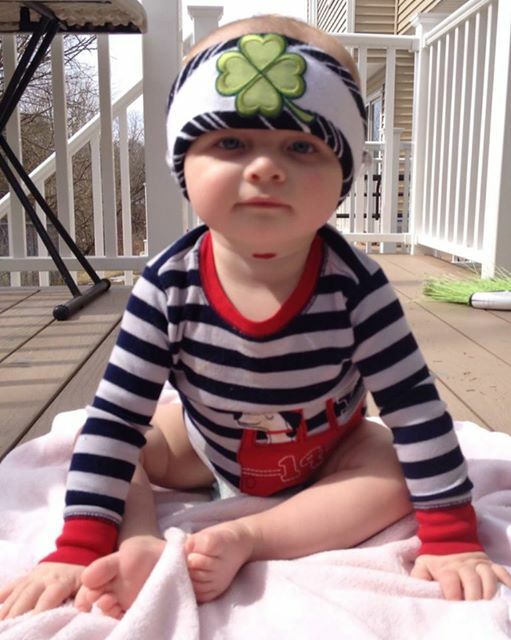 He may just have hypotonia (low muscle tone), which would account for his difficulty in trying to sit up and keeping his neck/head controlled. The physical therapist has also noticed that he tends to keep his head at a tilt to the left. This could be because of an issue with his neurons not communicating with a group of muscles (that is a complete non-medical way of putting what I understood the PT to be saying). There is a list a mile long of what could be the issue, so this Tuesday we have a consultation at BCH so we can see which way to go from there. Depending on the results of that, we could be adding Occupational Therapy or another specialist to his weekly “team”. There is an OT who works specifically with kids who get Cochlear Implants, so I called her after booking our Neuro appointment to ask if Finn did get referred to OT, would we go straight to her or to general OT at BCH. She gave me some much-needed perspective. 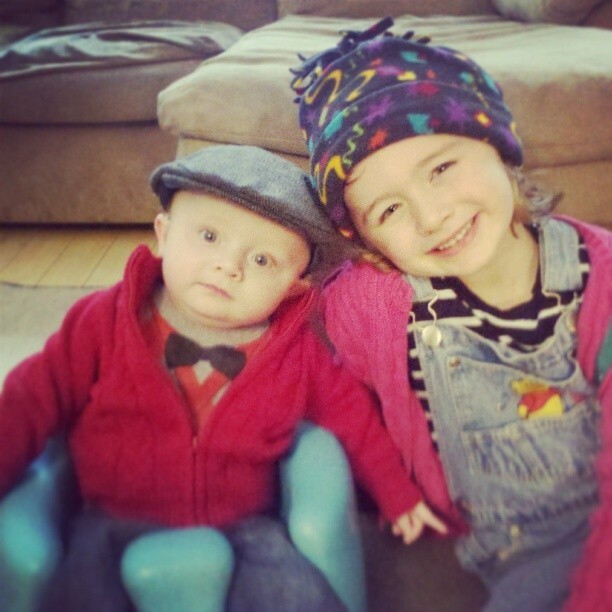 She said that most of the kids she sees at Finn’s age get referred to her because their development is so extremely delayed they need things like neck cushions and other drastic interventions to help them function. In a way that I find so very common of BCH doctors (& all of their staff really) she made me feel justified in my concern for Finn, she said she was proud of me for advocating for him in such a proactive way, all the while making me realize that his degree of delay is still somewhat minor when you open up the spectrum. Yeah, if you are going by “average” milestone markers, he is delayed in SOME areas, but he is ahead in some cognitive areas and she just went on to say how everything is relative. I had never met or talked to this woman in my life before that phone conversation, yet she gave up 20 minutes of her time to call and chat with me about my son and my worries. And at the end of it, it was pretty clear that she wouldn’t be the specialist who Finn sees (because of the types of cases she normally has), but she made sure to mention that she’d follow up with Neuro after our appointment on Tuesday and to make sure I called her if I had any questions. She could have been just as pleasant and told me who I should call, but no, she connected to me personally and made me feel like I just gained another ally for my son. I’m actually tearing up writing this because I do not know that I would be handling things very well if I didn’t have this hospital, this FAMILY, in our life. As I mentioned before, Finn had an evaluation recently with E.I. 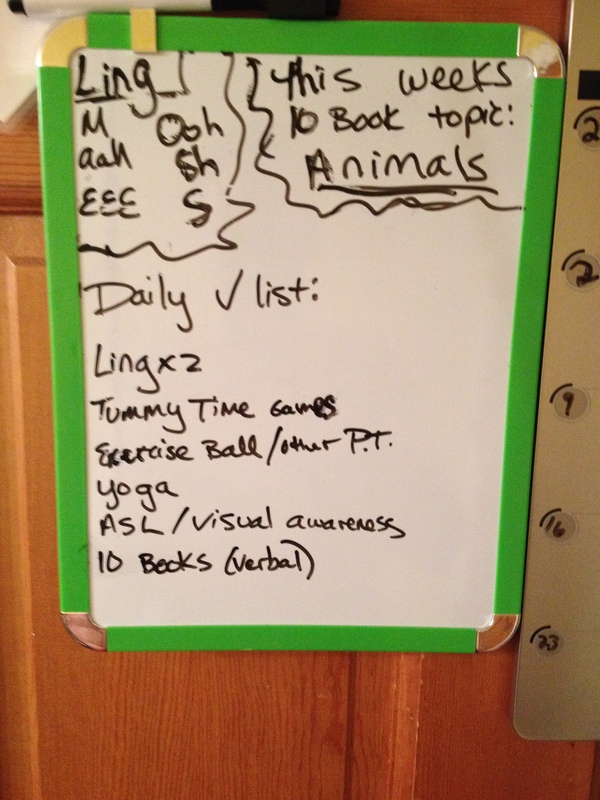 and we set up goals for him for speech, ASL, and motor skill development. Each specialist created with us his/her own specific specialty’s goal(s) and told us how they would implement them and how we could help his progress by doing things with him daily. Dan and I being just a TINY bit psychotic about wanting to do all we can on our end, took notes and made sure we got specific answers to what and how often we should be doing things (side note: I have found in my experience with E.I. that they must have to tread lightly about what they ask of parents because they seem to wait until we press for info or strategies before giving us a more active role. This is helpful to know for any parents who are going through E.I. for services. It’s not a matter of them not wanting to divulge, I’m guessing it’s more of a thing where they don’t want to overwhelm parents who might already be struggling). 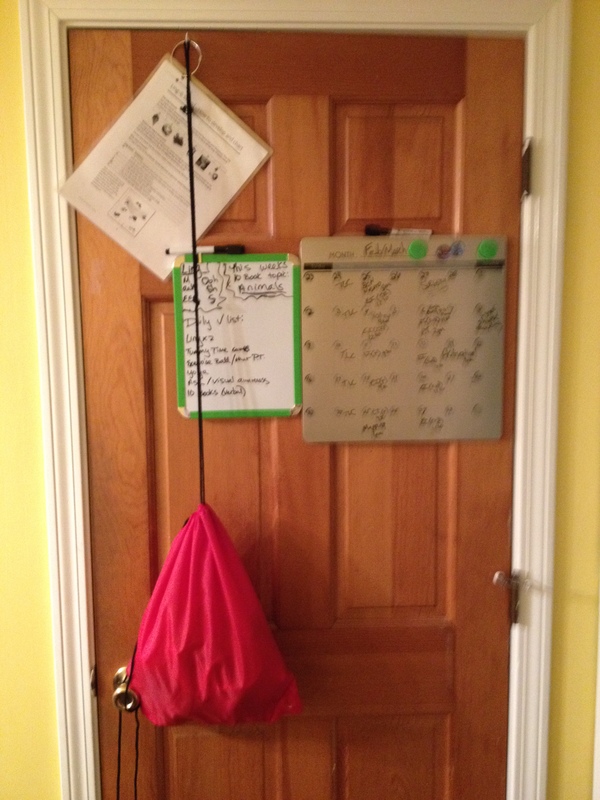 Dan has put together a Ling Sounds bag and we dedicated the closet door to holding therapy info and his daily routine/check list & monthly schedule (this may be the most organized we’ve ever been). Daily checklist of therapies/activities and other quick references. Finn gets his own calendar, lucky boy. It’s a little overwhelming to look at and sometimes it seems impossible to fit all of that stuff in on top of regular life with a baby, 4 year old, & two full-time working parents who work opposite shifts. But I know since we’ve started it, we have already seen major jumps in Finn’s total development. I don’t know if it’s the therapy, the fact that he doesn’t have that damn heavy helmet on anymore, or just a natural growth/developmental burst, but in the last 3 weeks Finn has begun to stabilize his head movements, he has developed at least 3 new sounds by (we think) mimicking our lip movement (this is HUGE for a profoundly deaf kid), his visual attentiveness to sign language is astonishing, and today he had his first crawling movement. These results give us the fuel we need in those moments when it gets tiring. Also, a lot of the “therapies” he gets are strategies that are presented through play and reading so we just incorporate that into our life in a (somewhat) natural way. Kayla LOVES practicing the Ling sounds with him –she always asks me to get the bag down so she can make the fun noises for him and see him react. My favorite activity is that we have to read 10 simple books a day that have a similar topic. We read the same 10 books for a week or so, which will help him with phonological awareness, vocabulary, and other speech skills. That being said, if there is anyone out there whose kids are growing out of their baby books and you are looking for an excuse to clear out some space, we’d be happy to take them off your hands. We are specifically looking for: nursery rhyme books, simple transportation (cars, trucks, etc. 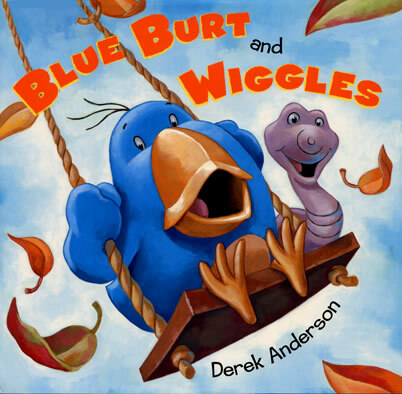 ), simple books about animals, and touch & feel books. So, we actually have two big days this week, though, obviously the surgery overshadows everything, but the Neuro appointment will be big in its own way because the results of that will point us in some sort of direction (and hopefully it will put at ease any of the “scarier” things that keep me up at 2a.m.). I’m sure after Tuesday it will be hard to focus on anything else except for the surgery. 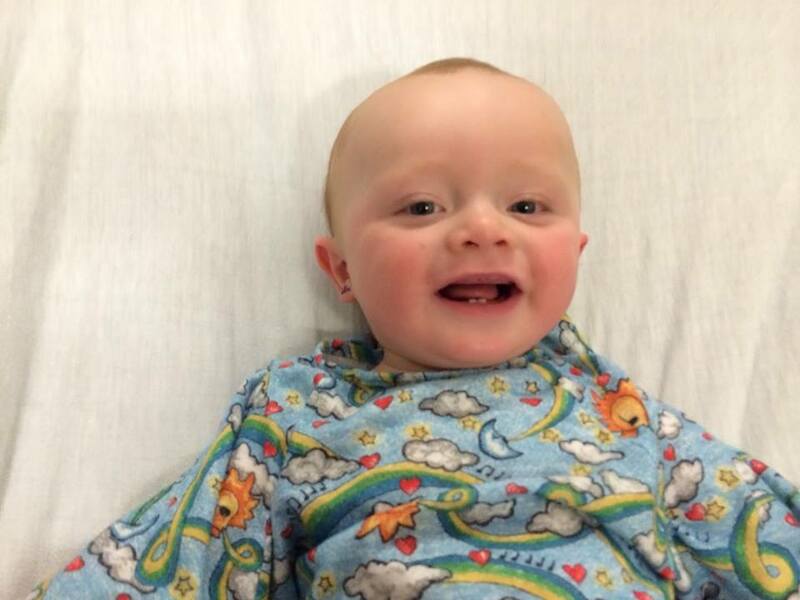 The hospital assures us that Finn will have a speedy recovery time, but he seems like a pretty tough kid so far so I expect he’ll be back to his smiley self pretty quickly. Happy 2014 everyone! I’m very excited to have recently heard from so many new people who are following HearsToFinn and especially happy to have been able to help anyone who is looking for resources or just a relatable story. If you are new to this blog, it’s pretty straight forward with the entries in numerical/chronological order so if you are at the beginning of your journey and looking for information, you can follow right along with the steps of our journey from post #1. I feel like each post has its own theme to it and looking back, the majority seem pretty positive. I have to give a disclaimer here that I’m not feeling the usual positive Katie lately. I’m feeling much more like frantic, sub-standard Katie. I use this blog to share our story and as an outlet, but I’m wary of writing too many things that might make people feel like they need to cheer me up or re-affirm what a good parent I am. I feel so awkward whenever I post something on Facebook about work or the kids and I get back a response saying, “You are such a great teacher/mom/etc!” Because then I feel like people are going to think I’m writing it to fish for compliments. Let me say this right out: Today’s post is going to contain a lot of insecurities I’m feeling about myself, but I do it to get it off my chest and to possibly help others relate if they’re facing similar problems. 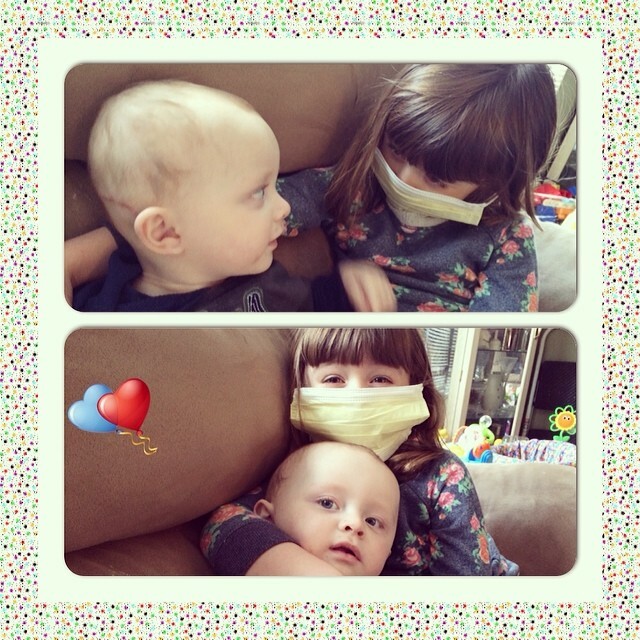 There’s been ups and downs for our whole family since Finn’s diagnosis, but I’m personally feeling worse right now than maybe at any other point. 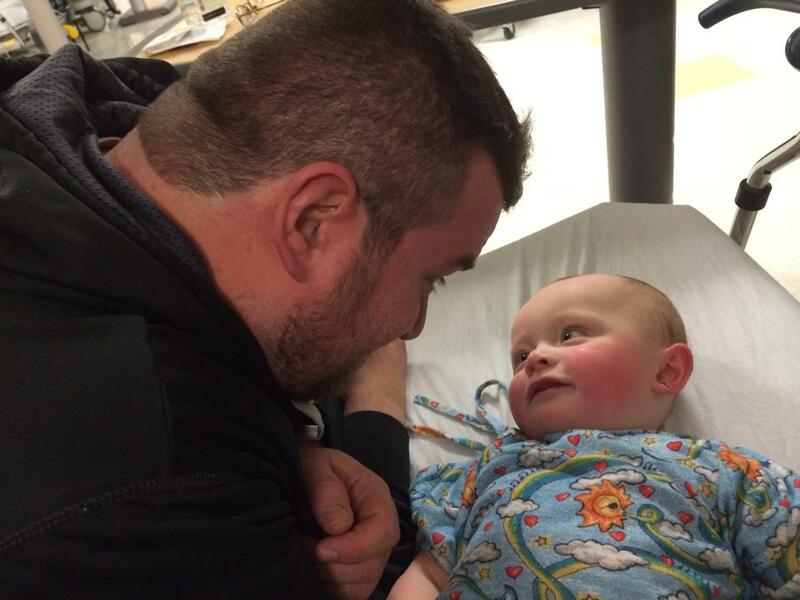 As much as first learning about Finn’s hearing loss was a shocking time, I was so caught up in the whirlwind of future plans that I felt productive and because of that, I never felt like I went through that “grieving period” that so many parents talk about. Maybe that’s what’s happening to me now. Is it that my emotions have finally caught up with me or are my newly found stresses and worries legitimate? Could it be both? I can’t even pinpoint my biggest concern for Finn right now. We have the surgery date looming over us like a ticking time bomb, not knowing how the surgery will go and what activation will be like, how he will react to sound, how much hearing he’ll gain; SO much uncertainty there. Almost more worrisome for me though are Finn’s other areas of development. I’ve known since he was one month old he would be delayed in speech (duh, he is deaf), but I honestly did not really care. Communication is what was important for me and just because he’d use his hands and not his voice at first doesn’t mean he wouldn’t be able to communicate. Now though I am getting worried about a lot of areas of his progress, and not just the ones I originally thought he’d struggle with developing. Finn is exactly 9.5 months old today. He gets assessed by multiple professionals on a regular basis. None of the professionals have expressed any alarming concern, but when we talk about his progress, there are almost always things he needs to improve on. 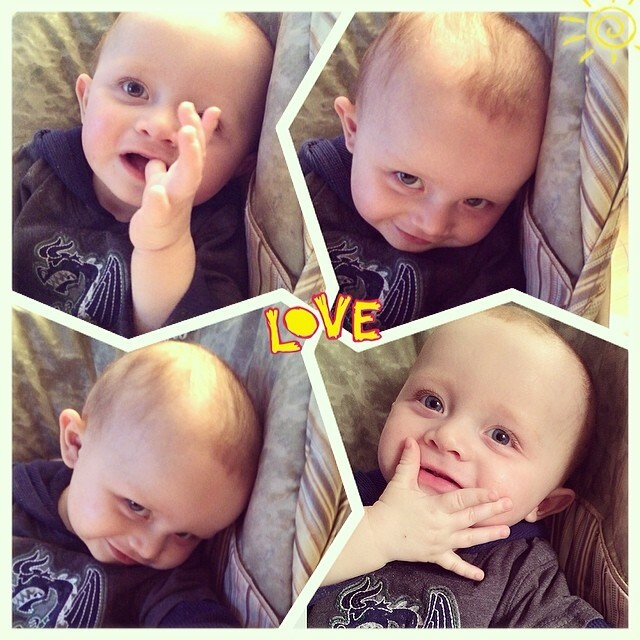 In a couple posts from last fall/early December I was pretty excited about the fact that cognitively he seemed to be progressing quickly, recognizing the sign for milk, attempting to sign it himself. That was really thrilling to watch him start and I was excitedly waiting for him to start picking up and recognizing more signs. As far as I can tell, this hasn’t really happened. I have joined so many groups and become part of so many communities relating to babies with hearing loss and I read about other babies in the same situation as Finn and how they start signing at 6, 7, 8 months old and once they start, their language snowballs; just like when hearing babies start with a couple words and then has a word explosion and then goes on to sentences. Even if I “toss out all those milestone lists!” and keep in mind that “each baby does things in his own time” like I’ve been told, just focusing on his own personal progress isn’t making me feel better. Ok, but maybe you’re saying, yes, but remember, it’s a lot harder for him to develop skills because he is deaf. Well I refute that because 1, deafness has nothing to do with cognitive ability (ask ANY deaf person and one of the quotes they share all the time is “Deaf does not mean dumb!”) and, 2, he was showing progress in that before. So now I’m racked with guilt that maybe it’s something on my end. Maybe I’m not doing enough for him to be able to communicate. I’m signing with him as much as possible, I’m picking up more and more signs every day, but maybe there is something else I should be doing? Then I think about his other areas of development. He still hasn’t gained full neck-control, still not sitting up unsupported for more than a few seconds, still only getting up on all fours and rocking, not crawling. He prefers to get across the room by rolling and still would much rather just lie on his back when he is relaxing and not be bothered (this being the main reason for his Plagiocephaly –flat head syndrome- and the need for his Band Helmet). This is with months of daily Yoga and Bumbo sitting. So on top of more worries that I’m not doing enough on my end to help him make progress, another path my wandering mind likes to take is: maybe there’s something wrong? Maybe, even with all the specialists, doctors, professionals, who see him on a regular basis, they’ve missed something. We were completely blindsided by learning that Finn was deaf –not having any deaf family members and having a perfectly hearing older daughter, so I think there is always this lingering feeling that it could happen again. We could be told that there is something else going on with Finn. We still don’t know why he is deaf (genetic testing isn’t back yet and even then, we might not get definitive results), what if we are missing something?? Or what if I’m just completely off base and just reading into things- having some sort of PTSD because I’m terrified we’ll be blindsided again?? I can’t help but remember one of our professionals telling us early on that deaf babies “have more of a chance of being delayed, but that doesn’t mean that they have to be delayed.” I took this as a personal challenge: Ok, my baby won’t be delayed! It might be hard work, but I’ll be damned if I’m one of those parents who sits back like a fatalist and accepts that there kid just won’t be up to par. How many times have I had parents of students with learning disabilities say some version of, “he’s just never going to be able to do what the other kids can do.” No way! My kid will be right on track no matter what. I won’t let him fall behind!!! Except, in that moment, I neglected to think of how I would handle it if he wasn’t “on track”. I have always prided myself with a sense of tenacity about my goals. Whether it be sports, college, or my career, if there was something I wanted to accomplish, I have always done whatever it takes to get it done. That’s exactly how I have been approaching Finn’s care (and how I’ve dealt with any set backs we’ve had with Kayla). So the fact that -in my mind at least- I am not doing enough to help Finn reach these milestones, makes me feel like a massive failure to him. I know it is not as black and white as all that, but that is the weight I am walking around with the past couple of weeks. I go to work and, like a lot of teachers right now, feel like my hands are getting more and more tightly tied to actually teach and help the kids in front of us; making us feel like we can’t do our jobs the way we think is best for our kids because in order to keep our jobs we need to appease some seemingly arbitrary standards that don’t match up to the kid’s needs. Then, I come home and feel like I can’t do enough for my own son- and that with all the focus on him and his activities, my amazing, independent, smart daughter is constantly being put to the side or receiving a harsher-than-I-meant-it comment over some small incident because I’m stressed to my limits and running on an average of 5 hours of sleep a night because Finn is still struggling to sleep through the night, sometimes waking up for over an hour crying with no way to communicate his needs to me because I have not given him enough tools to be able to do that yet!!! On that depressing note, I am reminded of a day in 5th grade. We had this math word problem up on the wall of the classroom. It was a visual math problem. It was a drawing of a snail going up a well. The problem went something like “There is a well X feet deep and this snail climbs up 3 feet every day, but each night when he sleeps, he slips 2 feet back down; How many days will it take him to reach the top?” I’ve actually used this random math problem as an analogy a few times in my life and right now feels like an appropriate time. I feel like that damn snail, giving it everything I have to move Finn forward, but every advance we make is countered by a setback. I supposed if I slip back into my positive self for a moment I have to remember that the snail will eventually make it to the top. Rounding out the analogy, Finn will be OK. 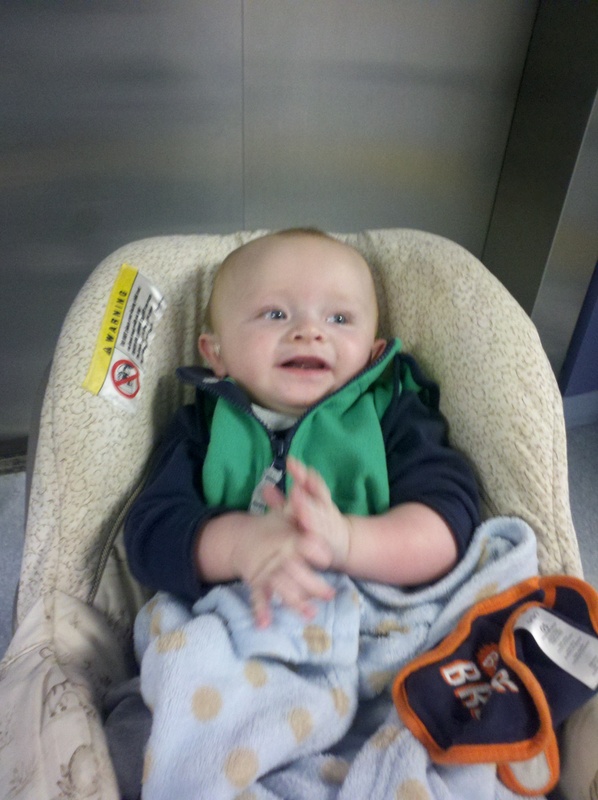 He is a happy baby for the most part and we’ll just have to start forming another game-plan or adding more strategies. Actually, in the midst of writing this entry, our awesome Early Intervention teacher got in touch with me via e-mail (I may have sent a rather frantic sounding e-mail earlier today) with some solid actions we can take to beef up Finn’s progress, including adding a weekly Physical Therapist, SLP, and AVT (on top of her services and his TLC program). She also gave me some great ideas like making photo albums of important/relevant people, places, & toys in Finn’s life to go over with him so that he can start connecting the pictures with the signs we do. Also, making one specifically to prep him for the surgery, which I would never have even thought of! 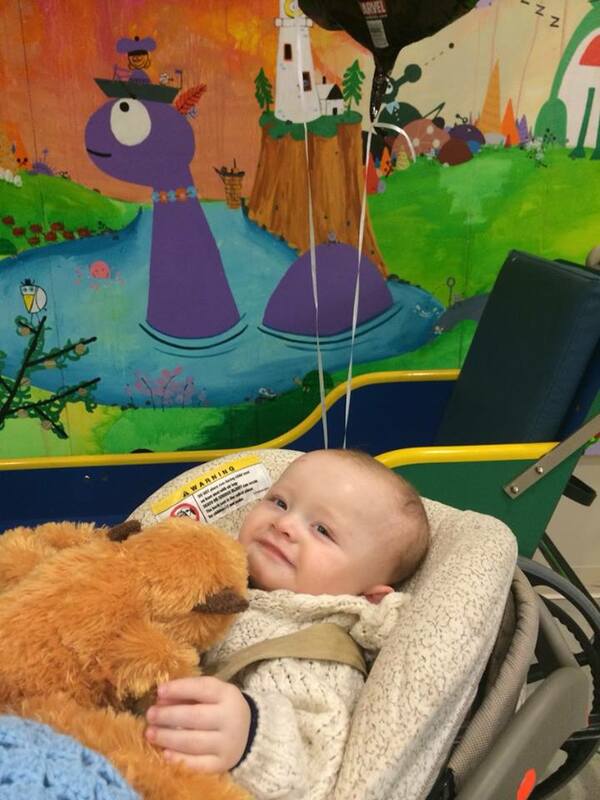 As far as updates go, Finn had a CT Scan on December 23rd that confirmed what the MRI and all the other tests have said – which is that structurally, his ears looks perfect. That would’ve been the only thing left to cause any issues with the upcoming CI surgery, but we can check that off the list. He again did great with anesthesia and was smiling within minutes. It was pretty surreal for Dan and me. Finn had to fast for hours. We had to be out of the house by 4:30a.m. 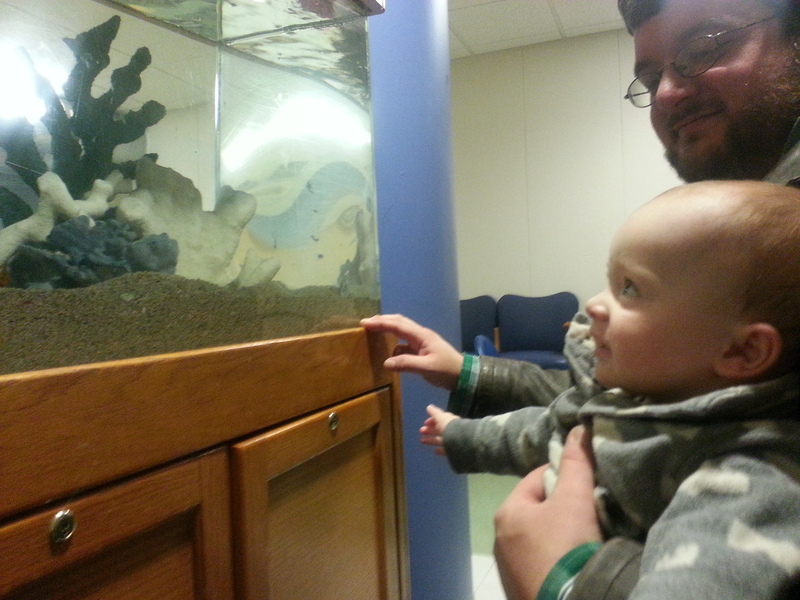 Finn would be going under anesthesia and getting another vital test done, but at some point as we were leaving I said to Dan, “Isn’t it weird just how routine this felt?” Compared to the MRI back in July and other visits, the fear and stress levels were much, much lower. That’s probably a combination of the trust we’ve put in Children’s, the knowledge that we had having experienced the MRI (anesthesia, test results, etc.) and the fact that in reality, this is nothing compared to what we are going to be facing in 27 days. I’ve talked to a few people whose children had to have surgery when they were younger and with all of their stories there was something they found out about or there was an accident and the surgeries were either immediate or within days. I think, in a way, knowing this was coming for months has given an unhealthy amount of time to worry about it. Every single parent has told us that it is a traumatizing experience. Almost verbatim they’ve said that we will at some point in that 24 hours question our decision, but every one of them also reassured us that they, absolutely, 1000% would do it over again if given the choice. I leave you tonight with something I need: INSPIRATION! I am going to make a concerted effort to spend this weekend creating some positive energy in my life. I will take advantage of the “warm” weather and get myself and my family out into the woods somehow (my happy place)! And I vow that I will take a cue from the people in the pictures and videos below and focus on what I can control and let go of what I can’t! And if I make a promise on the Internet, I have to stick to it, right? 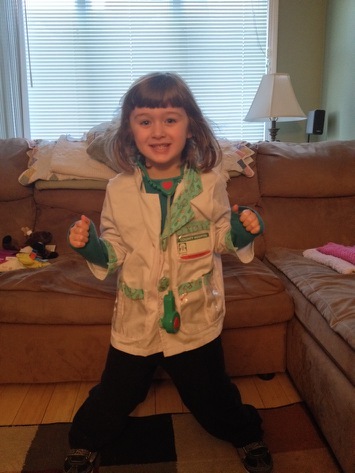 For career day at school, Kayla wasn’t just a doctor, she declared herself an OLI-OLOGIST! (Audiologist!) And someday she just might be. Seriously, they adore each other in the most heart-warming way. 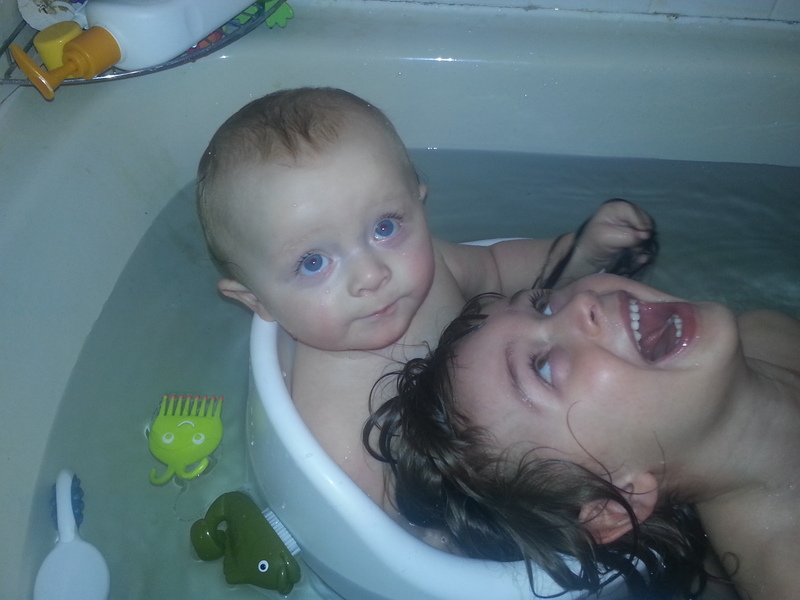 Tubby time is probably the best part of the day for all of us. Smiles all around! This guy, Derrick Coleman, you’ll see him play this Sunday and maybe even get to see his goose-bump inducing commercial about people telling him his whole life what he couldn’t do because he was deaf and now he’ll be playing in the SUPERBOWL! Oddly enough, this woman’s last name is also Coleman- no relation to the Football player haha- This is Rachel Coleman from the Signing Time videos. If that is the only place you know her from, this presentation will enlighten you on the reasons the DVDs cam to be and has one of the most relatable “finding out the news” stories. It is an hour long video, but I highly suggest it for any parent of a child with a disability. Truly inspiring! That’s all for now! Next up: Pre-op appointments!!!!!!!! There was so much information to share in the last post, I decided instead to do one for the more major stuff and follow up with this in order to share some of the other things going on with Mr. Finnegan and his all-around development. 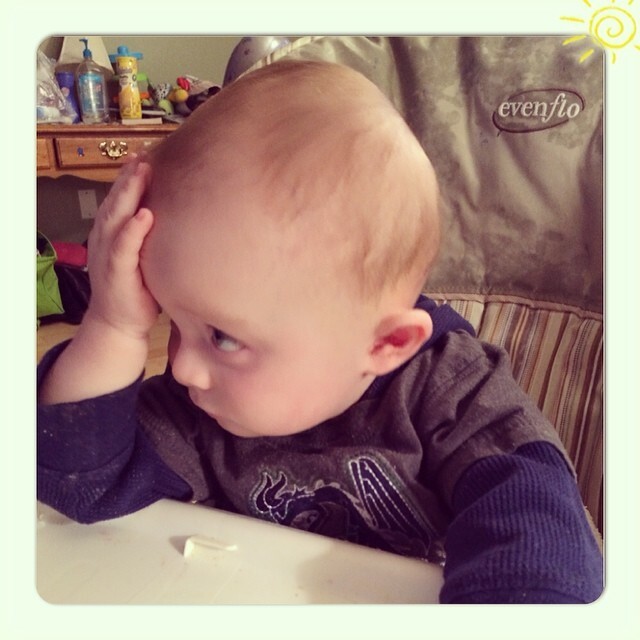 Let me start off by talking about my least favorite “mom conversation”: baby milestones. (not that dads don’t talk about this, but I’m just speaking from my experience with other moms). This topic comes up very often in all sorts of ways that range from innocent talk celebrating a babies newest “trick” to an all out “whose kid is more advanced” contest. I noticed this a lot more when Kayla was first born. Playground conversation often centered around how old the kids were and what they were or were not doing yet. No matter how innocent, I’ve always been very uncomfortable talking about this because on the one hand, I am very proud of my kids and want to celebrate them as much as anyone, but on the other hand, those conversations can also cause parents unnecessary worry if their kid isn’t “performing”. I usually end up countering any “celebration” with something comically deprecatory (Yea, Kayla’s vocabulary is quite extensive; most of the time she uses it to create a new, colorful way of telling me off). Anyway, I touch upon this because with Kayla, I kept hearing from everyone how “advanced” she was at every milestone. “Wow she’s sitting up at 4 months- that’s awesome, great job mom!” or “Oh my goodness, she’s walking at 10 months! You guys are doing a great job with her!” Now, of course, it is always nice to be told you are doing something right, but honestly, I think we give parents of infants and toddlers too much credit (good and bad!) sometimes. Everyone knows that each baby is different and remembering that and remembering that there is a reason why the lists of all of babies’ first milestones have ranges (sometimes huge ranges) is very important. I know this. I’m a reasonably intelligent and rational person, but it has taken me until recently to stop freaking out every time Finn goes past an age when either some stupid chart or Kayla’s records say she was doing something and he isn’t there yet. Our E.I. teacher constantly reiterates that it is about PROGRESS. Rereading this makes it sound like Finn is way behind or something and that is not the case at all. He struggled a bit with eating at first, but now is eating like a pro. 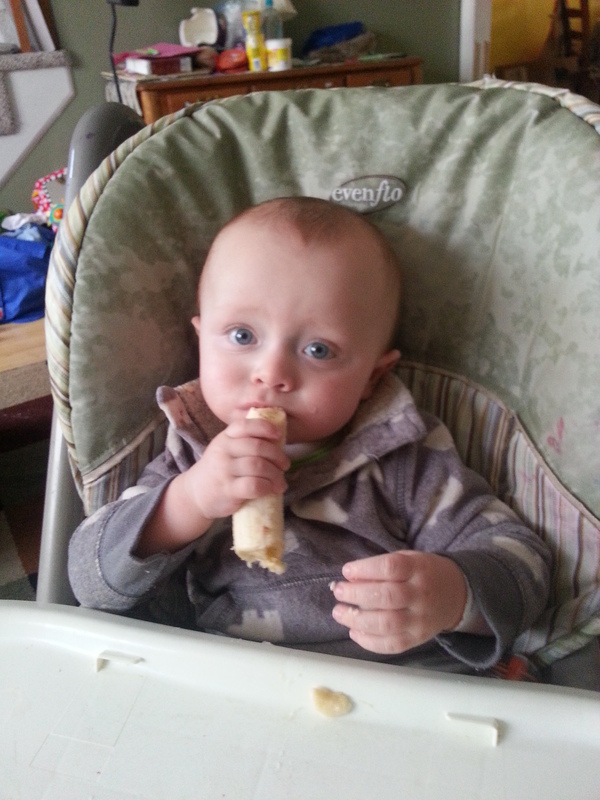 Loving his tofu just like his sister! Cognitively he is doing fantastically. 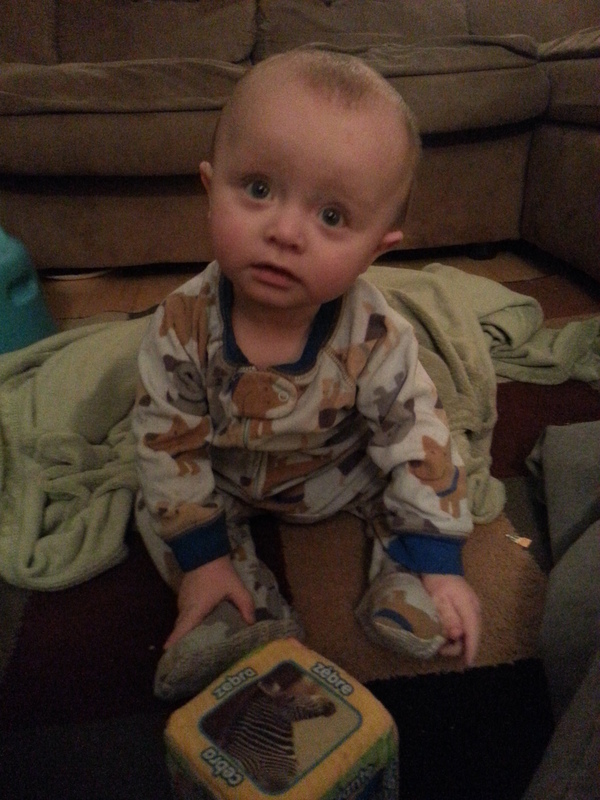 He is “visually attentive” when we sign or read to him- looking from the object/book to our hands and back again- showing that though he doesn’t understand it yet, he knows that our hands are communicating. When he wants his milk and starts fussing, he calms when we sign milk to him and has even started this really funny, flamboyant version of the milk sign himself. He LOVES when someone fluent in ASL signs to him. It is so cool to see his rapt attention on their hands (in contrast, his eyes tend to wander when I am signing, almost to make a point of letting me know that he is bored with my slow-as-heck signing). One thing that he is still working on is strengthening his core (just like mama!) and sitting up. He absolutely hated tummy time as an infant and would instantly scream & cry (and, sorry, but knowing he couldn’t hear and then putting him in a position where he couldn’t see either was not exactly something I felt OK doing to the poor kid). 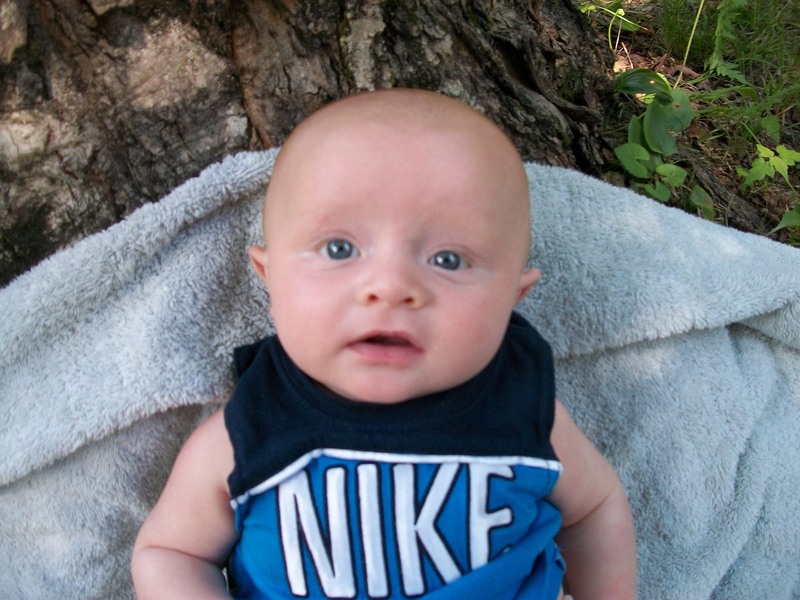 He was also born with low muscle tone, which I thought had to be my fault, but our Physical Therapist said that it is just the way some babies are born. Kayla was born with high muscle tone- luck of the drawn apparently. 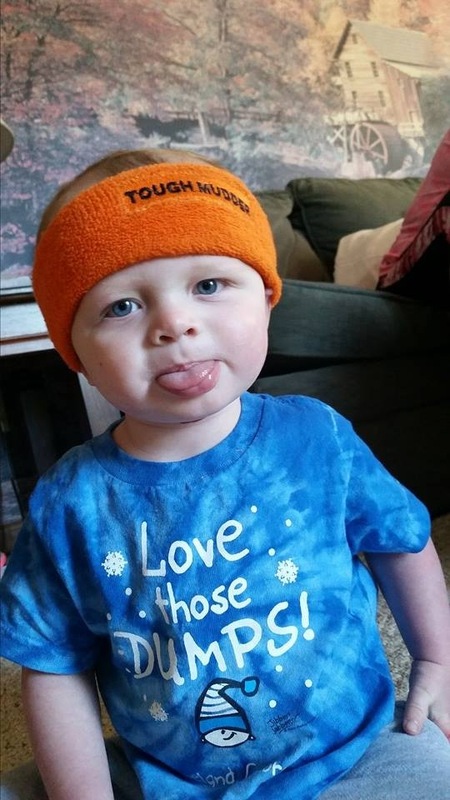 To help with this, we have added to our Early Intervention team a physical therapist to pump some iron with him – and by that I mean Itsy Bitsy Yoga : ) Dan is like a baby Yogi with Finn and his routine and he has made leaps & bounds already. He is trying so hard to sit up and he is ALMOST there, but again, it’s about PROGRESS. 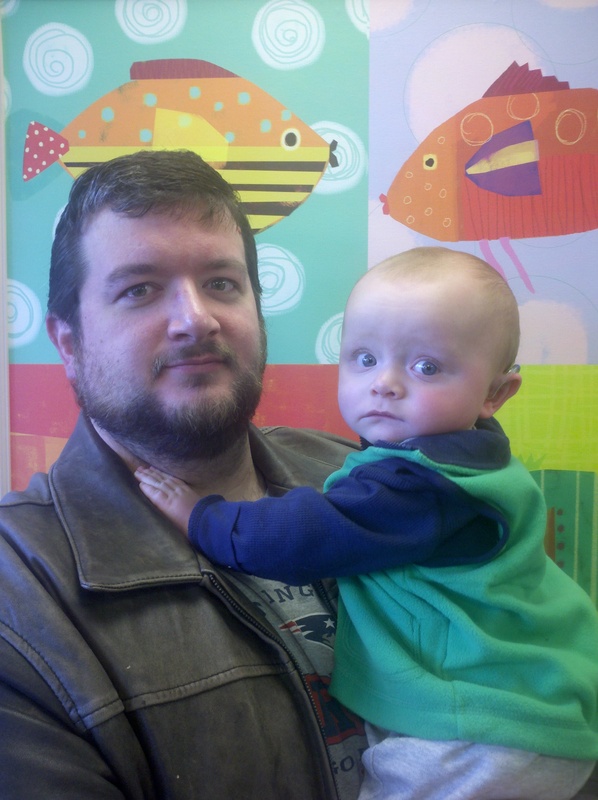 Even with that progress, we (meaning Dan & I, his pediatrician, E.I. & his other specialists) all agree that his head is still a bit flat and we need to make sure it has rounded out before the surgery in February. 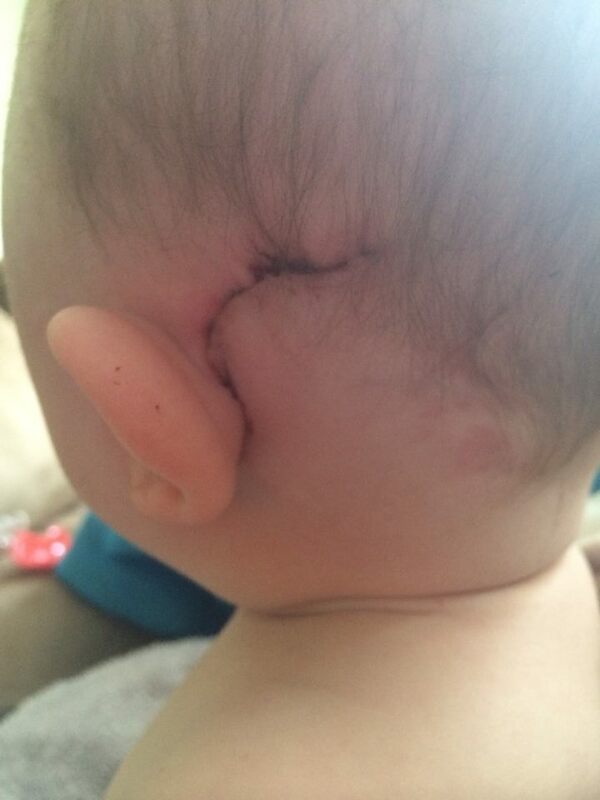 There is a chance, especially now that he is starting to sit up, that it would do this naturally, but that was not a risk we wanted to take with a surgery coming up that will include drilling into that beautiful skull. 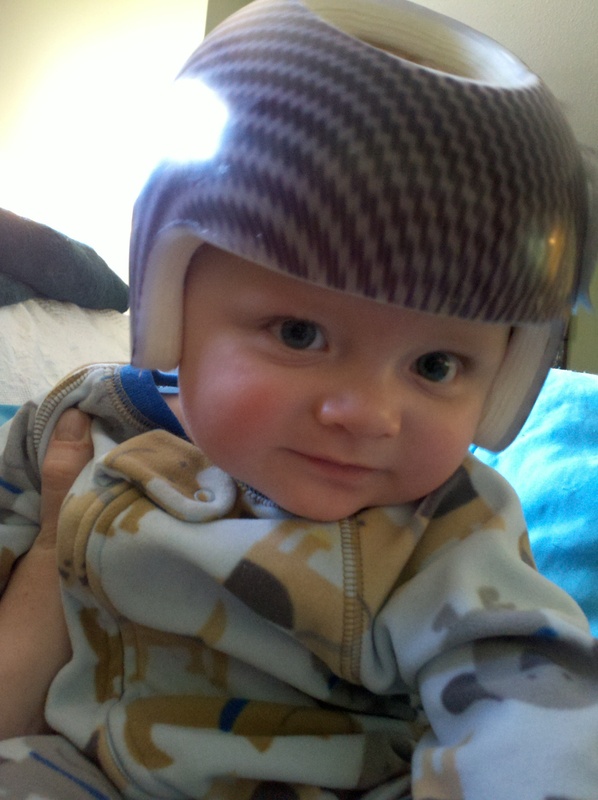 We made the decision to get him a Band Helmet back in November at his 6 month check up. 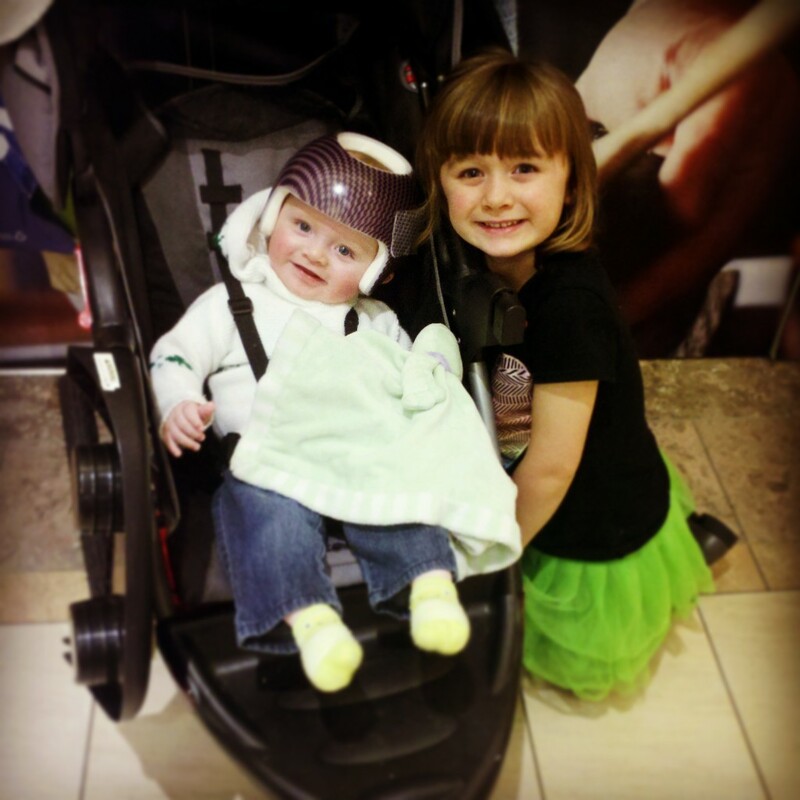 Early Intervention had given us the name of a PT at Children’s who does the Band helmets, but then our pediatrician recommended one in New Hampshire (I forget the exact reason, it may have been availability for appointments?) and we made the big mistake of taking that recommendation. I have said it before and I’ll say it again: if you need anything done efficiently and want the most trusted people GO TO CHILDRENS! Every time in the last 7.5 months that we have gone somewhere other than Children’s we have been disappointed in one way or another to varying degrees. Whether it be atmosphere or competence, they have never let us down. We are KICKING ourselves for getting talked into going elsewhere. I won’t say the name of the place we went because I don’t want to tarnish their reputation too unfairly -that being said, if you are given the option to go to a PT in New Hampshire, I am more than happy to tell you privately the company so you can have a heads up. The problem was that this started out being a little bit time-sensitive to get his head rounded, but it being mid-October and the surgery not being until February, we thought we had a big enough buffer- assuming the PT facility would understand that we were running against the clock. Well, you know what they say about people who assume. Our initial appointment was Tuesday, November 5th (after TWO phone calls from us and one from our pediatrician trying to get us in as early as possible). It went smoothly and the Physical Therapist seemed to know his stuff. Thankfully, the office used laser technology to scan his head and make an exact replica (on screen) to make sure the helmet fit Finn precisely. This is in contrast to the “old” way- the way some offices still do it- which is covering the babies head in plaster with only his mouth left open and making a mold to send in. Getting ready for the laser scan; looking like a Teletubby. Entranced by the laser beam even with mom & dad doing silly dances and faces to get his attention. 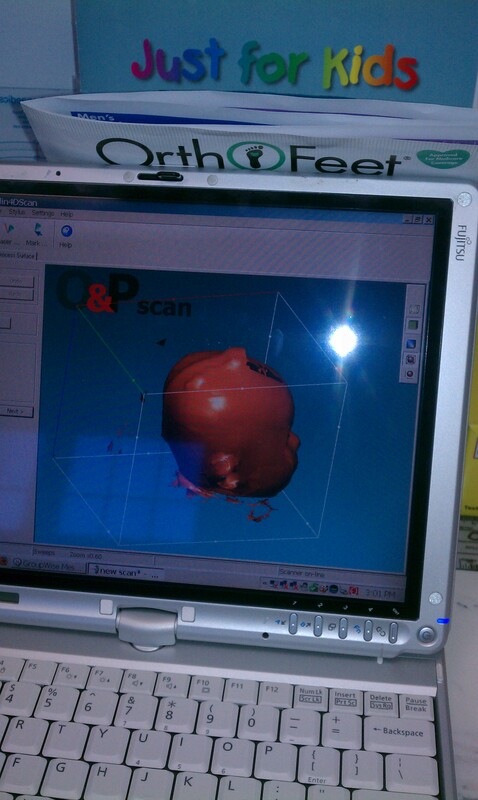 As they scanned FInn’s head, a 3D image of his exact skull popped up on the screen. Super-cool. 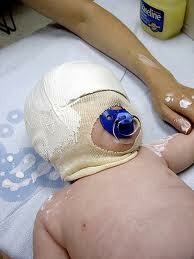 If the facility does not have the scanning technology, this is what they have to do to make a mold of the head. We did not know about this and just lucked out by getting a place with a scanner. Something to keep in mind if you are considering a PT for a Band helmet. We told the PT about Finn’s surgery and how important it was to have his head rounded by then and he assured us that insurance should approve it by the end of the week and then they would send in the order and it would be in about 5 days later. Sounded great to us. By that time marking, Finn would have the helmet by the following Friday (Nov. 15th). Even if it was early the week after that, we were still on a good pace. Being the annoying parents we are, we followed up at the end of the week to make sure everything was all set (more worried about insurance holding us up than anything else). We got no call back, but when we contacted Harvard Pilgrim, they said they had approved it already. So, we called the PT back early the next week; again no call back. Dan finally got in touch with them and the secretary, after looking around the office, finally said something like: “oh, yeah! We got the insurance approval right here. We just need to send it in.” Hmmm. So, OK, a time-sensitive helmet that got its approval from insurance almost a week ago is still just sitting there? Fine, if they sent it in that day, it was still only a week or so delayed. Let’s fast forward to when we got the helmet: December 6th. A month after the appointment. Only a couple of weeks off, but when we followed up with them over that couple of weeks at least SIX times, we got zero call backs. No idea if the delay would be a short one or if there were any issues where we’d have to start the process over again. Trying to decide if we should just go right to another doctor, but not knowing if we’d get a call the next day that it was in. Finally, Dan called and left a very strongly worded message on their machine and at 7am the next morning he got a call from the PT himself apologizing because HE HAD BEEN ON VACATION. Seriously????! 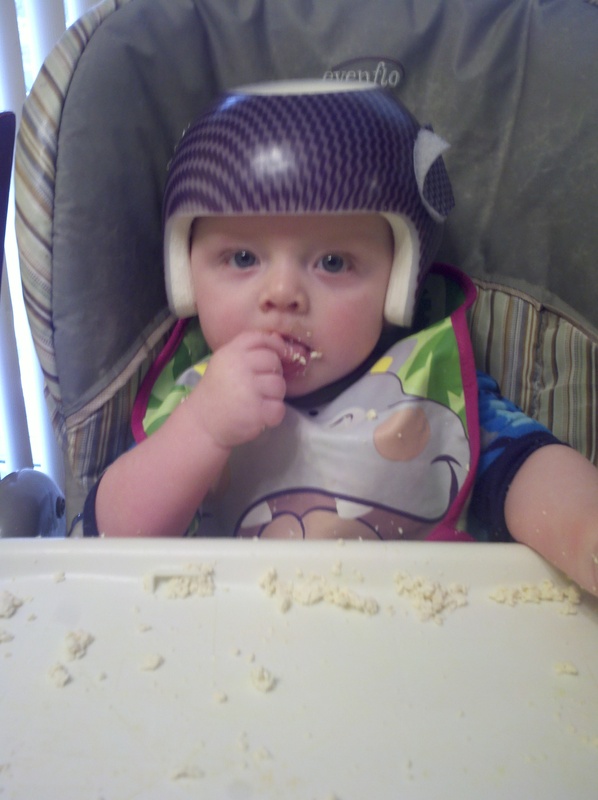 Anyway, we got the Helmet Friday and Finn’s been doing great with it. We got one Bruin’s sticker on it and hoping to find big, gold number 55 on the back in honor of the great Johnny Boychuk. Couldn’t you just eat those cheeks right up!? Go BRUINS!!! 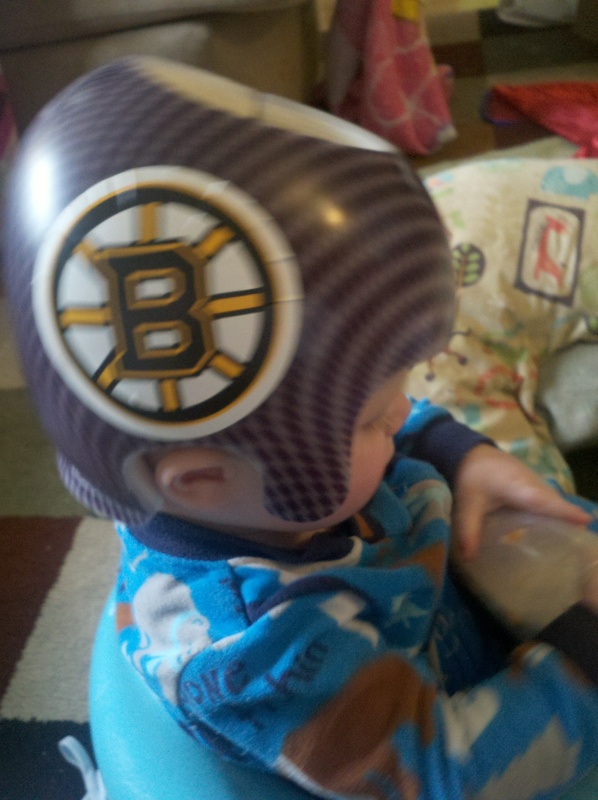 Hopefully this won’t be the last hockey helmet one of my kids wears! 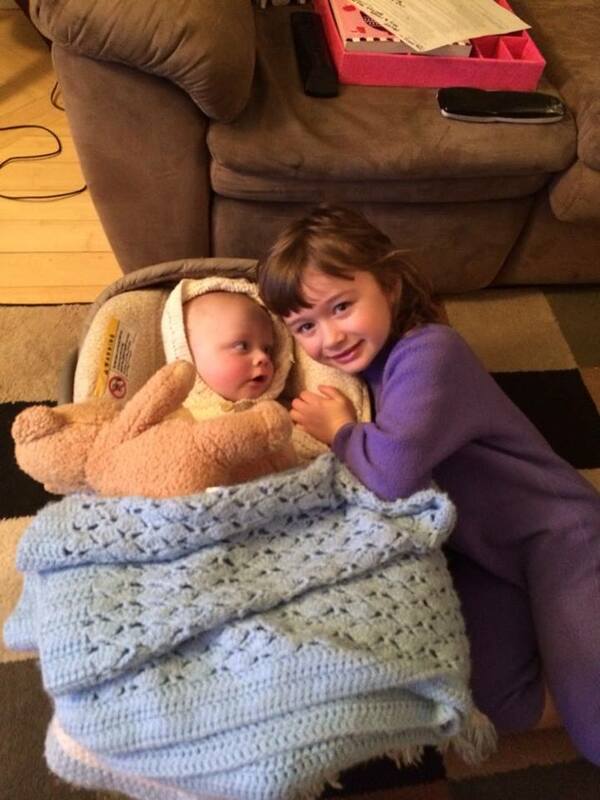 Kayla continues to be a very loving big sister and can make him laugh harder than anyone with her antics. Actually, one way I get him to tolerate sitting in his Bumbo seat for an extended time is by putting on dance music and having Kayla give a performance for him. 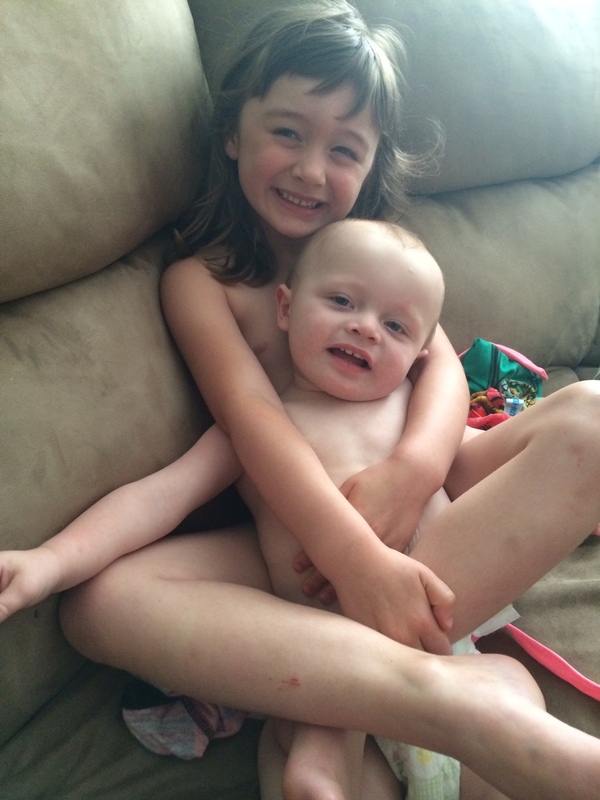 Her dancing is quite…energetic…(think Zumba on Speed)- and he will sit and watch her and giggle for so long. This week we meet the new Speech-Language Pathologist who will be joining our EI team after the surgery (I think this is Finn’s 4th SLP? Bring them on, I find SLPs to pretty cool people haha). He works in a Lowell school too and his reputation is fantastic. 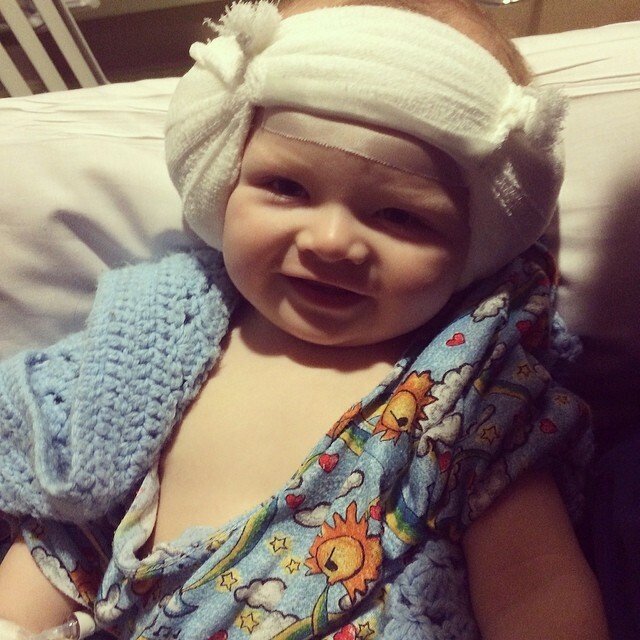 We’ve heard his name from all different areas – Children’s, EI, Finn’s school- so it’s exciting he will be helping Finn learn how to hear and understand what he is hearing. He is an AVT SLP and he is open to the family incorporate sign into his therapy & every day life, which is a relief as this is a must for us. We also recently got to meet with someone from MCDHH. We have now met a few people who work for them and, overall, they are a bunch of fantastic people. Our case manager (if that’s what she’s called?) was nice, but seemed a little overwhelmed with cases. I guess they each have hundreds of people to service. Yikes! Our connection to them will be vital when Finn goes to school; whichever school we think fits him best at that point. Because of the nature of any public service that has people who are overworked, I am nervous that things with Finn could slip through the cracks and I know we will have to be extra vigilant when he is older, especially if we feel strongly about sending him to a specific school. As of right now, I would love for him to go to Lowell Public Schools if he is having success with the CIs. Considering the good things I’ve heard about their deaf & hard of hearing program and that I work in the system, I am hoping it won’t be a problem. I have to say, I was a bit disappointed in our appointment for a couple of reasons. One, it made it was made clear when the appointment started that we are one of MANY clients because she asked how Finn’s surgery went and we had to point out that he hadn’t had the surgery yet. The woman apologized saying she must have just reviewed at the wrong file. Not a huge deal, especially considering the amount of clients she has. It just reminded me that we are going to have to be on top of our game. There were a couple of things that made me squirm in my seat and I am hesitantly writing about it here. I do not want to make anyone feel badly or talk negatively, but I also think sharing what made me squirm might put it out there for people to consider when they are talking to parents. One, when I mentioned my inclination towards having Finn go to Lowell schools (after sharing that I taught there) the first reaction was “wow, people are usually trying to get out of Lowell!” I do not think this was meant in any harsh way besides honest surprise and maybe that has been her experience with Lowell, but I am very sensitive to what people say about our amazing school system. Also, we live in a town without any programs for deaf children, so I was confused as to why this wouldn’t be the most logical place for him. The second thing is something I have heard other people say and, again, people do not mean any harm when saying it, but if you are working with any kids who are special education, special needs, or in any way in a “sub-population” please, please, PLEASE try to refrain from calling the rest of the kids in a school the “regular” kids. To be told that of course it “would be a priority to get your son in with the regular kids” was probably a slip of the tongue, but, especially if you are working with kids on Ed Plans/I.EP.s, professionals should take care to not make the parents feel like their kids are not “regular”. Being in so many IEP and parent meetings myself, I know that wording can make a huge difference in how parents perceive their kids are being handled by the adults in the room. I am probably being over-sensitive, but I needed to share that and hopefully if it happens to others, you’ll be more prepared – I wasn’t and it weighed heavily on my mind and brought up many thoughts of how many times Finn might be considered different or not “regular” because of his deafness. One quick note about last blog- I made a technical error when talking about mapping. I mentioned that our SLP would be doing the mapping and thanks to my SLP and Audiology friends, I know I have to fix that. Looking back at my meeting notes, the SLP said she would be present for Finn’s mapping, but it is the audiologist who does the actual mapping. Thank you to those of you who let me know about my error. It is really important to me that this blog be a place where people can get helpful, clear, and factual information and I welcome anyone who can help me dot my T’s and cross my I’s (Sarah, that last sentence was for you ;). “Well, I guess, the fooling around is pretty much over!” That line from Caddyshack is a great representation of how we are feeling after yesterday. Seven months since this crazy train started and every once in awhile there is a day that ups the ante and yesterday was definitely one of those days! 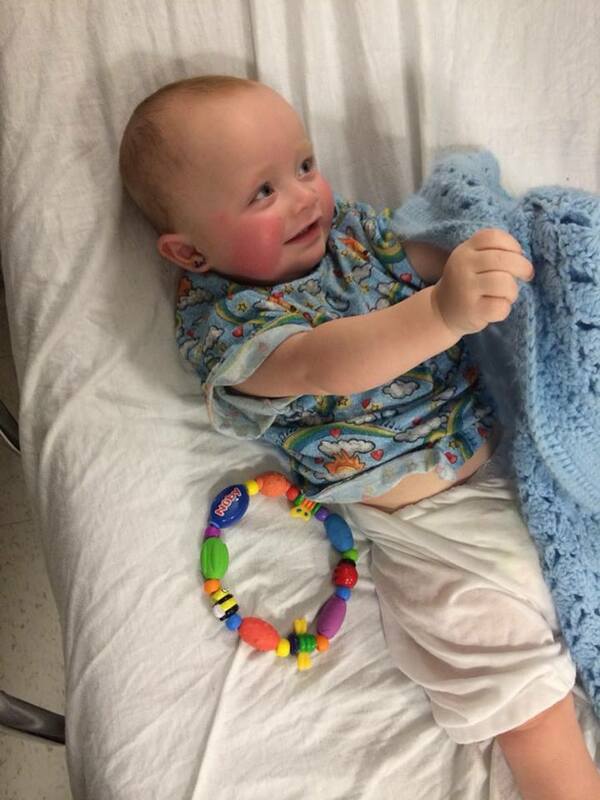 Just to rewind a bit- Finn is part of the Cochlear Implant Program at Boston Children’s Hospital, which means that he has a group of specialists who all have Finn as their common patient. They even have big meetings together just to talk about him! Imagine some of the greatest doctors in the world, coming together to talk about the specific needs of your child. Have I mentioned how KICKA$$ Children’s is!?!? First up was our meeting with our Cochlear Implant (CI) Speech-Language Pathologist (SLP) and our Communication Enhancement Psychologist (what a title!). We talked about the many services Finn is receiving and how he is developing and I got to have some nerdy shop-talk about language comprehension with them. The Common Core may or may not have been brought up. Ha. FInn and Daddy checking out the art work- Finn loves the bright colors and the texture of the paintings in the waiting room. Mommy’s turn to tour the art with her baby boy. I kind of block it, but the mural behind me has ASL fingerspelled phrases having to do with Audiology. After that meeting, we went up to get blood work to send off to do some genetic testing. I try to tell myself that the results of this are only important in the fact that they can tell us if Kayla or other family members might also be genetic carriers of deafness, but to be honest, I still have a pretty strong desire to find out why he is deaf. I know it shouldn’t matter, but it does and I need to keep in mind that there is a good possibility that we may never know, but there’s also a chance these first blood tests come back with the exact reason. Until then, no matter how many rational ideas I hear or know, there will always be a crumb of guilt that somehow, it’s something I did wrong or could’ve prevented…as much as my reasonable side tells me that is bologna. Within minutes of getting a ton of blood drawn, he was smiling and doing his new favorite trick: clapping when daddy claps! Next, off to meet our surgeon! No offense to any surgeons out there, but they do tend to have a reputation for not exactly having people skills. Some come off as a bit condescending or “above” the average laywoman. Well, Dr. L destroys that stereotype in every way! I had had the pleasure of being in on a panel of CI surgeons last summer in which he was a speaker, so he was already on my radar as a potential for Finn; couple that with the MANY parent recommendations we got about him and we knew he was in the top echelon of CI surgeons at Children’s (and therefore, in the state/country). Meeting him yesterday was a huge step in this process. I mean, this is the guy who is going to be drilling a well into our baby boy’s skull, then stringing TEENY electrodes down through his cranium, into his cochlea, narrowly avoiding the nerves that control facial movement & taste, for an over 6 hour surgery. He might be the single most important person in Finn’s treatment. And Dr. L was brilliant. He did a great job of gauging what level of knowledge we were at (because I’m sure there are some parents who have a much better scientific background than us and many others who might be hearing what the surgery entails for the first time) and then explaining the surgery in extreme detail without ever once talking down to us or talking above our heads. This is the part that got exciting. Last summer, we were given a checklist of steps that have to happen to qualify and then be approved for the surgery. We have made absolute sure that we have checked each step off at the earliest moment possible. If they said,for example, that Finn needed an MRI between 4 and 8 months, we were calling for the appointment at 3.5 months. If they said we would probably need to decide on preferences for surgery “at some point” we sat down, did as much research as possible and were ready with our solid decisions at the very next meeting. This sounds a bit boastful, and you might be sick of hearing it, but I cannot stress enough how VERY VERY important it is to take control of anything you have the power to control when it comes to your kid’s health. Obviously, we could NEVER have done it without the invaluable resources we have had with Early intervention (EI) and Children’s, but as we’ve been told time and time again, proactive parents get things done faster and make everyone’s job more efficient. Anyway, now that I have just completely come off as a pompous bighead, I’ll extrapolate on that with what happened next. On our checklist, the order is supposed to be something like after seeing the surgeon, the CI team (all 6-8 professionals) will meet and talk about your case and make a decision whether or not your child will get the go-ahead to have Children’s do the surgery. Then you do blood work, CT scan, pick out a CI device, talk about what kind of Speech-Language therapy approach you will take, and a few other things. During our conversation with Dr. L, we shared with him what we’d shared with the SLP and Psychologist that morning about how we had pretty much done everything on that list (besides the CT scan, since it wasn’t ordered yet) and we had made all of our decisions. We explained the research we had done and how strongly we felt about having the implants done bilaterally (both sides at the same time/same surgery) and how, to us, it made more sense to add a couple hours onto one surgery than have 2 separate surgeries with the risks of anesthesia and also risks of making one ear the “strong” one and the other the “weak” one, never fully able to catch up to the ear that was implanted first. We shared with him our extensive research into the different CI companies and asked his opinion on our decision to go with Advanced Bionics (more about AB below). So we finish up our spiel and he picks up the phone and cryptically says to the person on the other line, “yea, they are definitely all set, come on up.” Haha, I felt like we had passed some sort of test. We had been told (as recently as that morning!!) that we would have to wait to find out a surgery date and for the team to have their meeting and discuss our case. On our checklist sheet, there were definitely a few steps left before something more “official” was told to us. Instead, in walks in the Administrative Coordinator (she is basically the conductor of this CI orchestra and handles almost all the insurance stuff, schedules all the appointments, and pretty much keeps everyone’s ducks in a row). Dr. L gives us this kind of half-smirk and I can’t remember exactly what he said, but something to the effect of us seeming to have a pretty good handle on everything and the we were “obviously knowledgeable” in our decisions (see, I blame our specialists for my sense of self-importance haha). At this point, he said the CI team meeting was more of a formality than anything and we were good to go!! The Admin. Coordinator sat down and said the words that gave me & Dan chills: “How does February 27th sound for the surgery date?” AHHHHHHHHH. A date. What is it about having the date set that made it SO INCREDIBLY REAL. I felt like I was going to throw up and I wasn’t sure if it was from nerves, excitement or some combination of both! Dan’s face showed such an identical reaction that I almost laughed out loud. Then it was kind of a whirlwind. A nurse came in to ask us a bunch of routine pre-surgery questions and order a CT Scan for Finn to look at his ear bones. Then, she sent us up for more blood work (poor Finn was such a trooper as the nurse had to stick the needle in and draw blood from almost exactly where he had had it done about 3 hours earlier!) to analyze before the surgery. And this is where the unique set up of Children’s CI program has its advantage. As I’ve shared in previous posts, the CI program has it’s own area in the hospital. So, at another hospital, to see the SLP and then the psychologist and then the surgeon, we would have been going all over the building to those different specialties. I’m sure this does not make a massive difference in treatment, but yesterday was proof that it makes a big difference in ease of communication (and when isn’t communication a vital part of anything in life?). Besides making it easier for us as parents walking room to room instead of wing-to-wing or even building-to-building, it also made it so when Dan asked a question about our CI device that was better suited for an audiologist to answer, they just had us walk down the hall and grabbed her from her office for a quick chat. We hadn’t had an appointment; we didn’t even have to find an office. 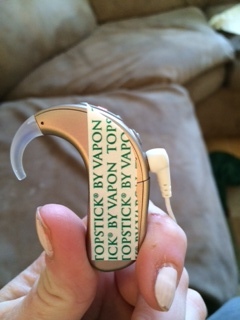 We just had a quick question that was easily answered and then Dr. O, our audiologist, -who, I know has her own schedule and probably a million things to be doing- took the time to go get the actual device, show Dan all the parts, and chatted about it for about 15 minutes, thoroughly answering his questions and sharing her own expertise. Just because she happened to be in the hallway when we were on our way out. A note about our decision to go with Advanced Bionics: choosing between AB and Cochlear (and to some extent Med EL) is like choosing between a Porsche and a BMW (I stole this analogy from someone, can’t remember who). 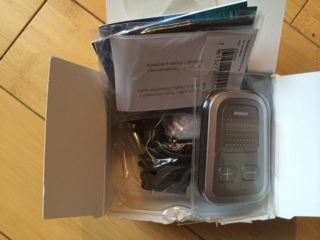 Every person we have talked to or read about (and that is a huge number) is happy with the device s/he has. We have never heard anyone say they wished they’d gone with a different company. That being said, it is still a major decision because it’s essentially choosing which computer you are putting into your child’s head FOREVER (and you thought deciding between the iPhone and Galaxy was a tough decision!). To make the decision even harder, both Cochlear and AB had brand new processors approved this year, so that didn’t help sway us. Ultimately, we chose AB because of the conversations we had with adults who chose AB for themselves and some differences with electrodes (and other technical stuff that Dan is much better at explaining) and, to a lesser extent, the waterproof capability (to be fair, Cochlear has a waterproof case, but not a full waterproof device like AB). The best part of making a decision like this is that though we did take painstaking measures to find out as much as we could about both companies, we knew whichever way we went, we would be in good hands. I want to give a big shout out to both companies for their excellent customer service and availability through e-mail, Twitter, & Facebook. I was amazed that I could send out a Tweet asking a question specific to my needs and both companies would respond within 24 hours. I wish more companies in life had this level of customer outreach. Those of you on Pinterest, Advanced Bionics is on there and even people who are not even remotely in need of CI information would find their pins really neat. Some heartwarming videos and just plain old cool stuff! AB Pinterest Site. Another advantage to Children’s set up was that while Dan was talking to Dr. O., I got to meet an absolutely beautiful 19-month old girl and her mom who had just moved from Ireland to have the CI surgery and future treatment at Children’s hospital just the month before. They shared their stories and the struggles they faced being in a country that doesn’t have the newborn hearing screening and how they were told again and again that their daughter probably just had fluid in her ears or was just not focusing. I invited her to the Shared Reading Program and asked a passerby (no idea if it was a nurse, secretary or doctor) if they had any extra fliers for it, and we had one in about 1 minute. We talked about American Sign Language and all the resources we had been able to utilize for free. And seeing this beautiful girl, smiling and laughing when Finn made babies noises and looking from person to person as we spoke, obviously hearing the world around her, when only a MONTH before she had heard nothing, was inspiring. It also reinforced to me how very fortunate we have been in where we live. Not just living in the U.S., but in Massachusetts. People as close as New Hampshire have been told that there just are not as many or as good of resources for deaf children in their state, especially when you compare it to Massachusetts and other states like ours. There are a few more updates to share with you all, but I wanted to get the big stuff out of the way first. Look for another post Friday or this weekend for a more general update of Finn’s progress, development, and other happenings since it’s been a while. I love this book and there are so many great quotes you can pull from it at any given time to help you in a myriad of ways. This quote resonates with me right now because of the message. It basically says that no matter what life throws at you, it is your choice how you react. I’m not a huge fan of the saying “everything happens for a reason.” I understand why that can be helpful to people and I’m probably biased against it because I connect it to a time in my young adulthood when a lot of well-meaning adults were saying it to me, but then had no concrete answers as to what that reason was -and in my adolescences it became a sort of cop out that adults would say because I was just an ignorant child who couldn’t see the big picture….anyway, I think the Steinbeck quote is more helpful. Instead of accepting that there might be some reason why a particular thing has happened in your life and possibly becoming side-tracked by looking for that reason; I like to think that things happen. Period. They happen and you either deal with it or you don’t. Now, this might be just as much an oversimplification as “things happening for a reason”, but that’s the mind set I need to do the things that need doing. When thinking about the prospect of going back to school and thinking about how this summer felt so overwhelming with all the appointments and things that we were doing with Finn, I couldn’t fathom how we would manage. I remember what an adjustment going back to work was when Kayla was that age & that was hard enough! But in the end, you just gotta man up. 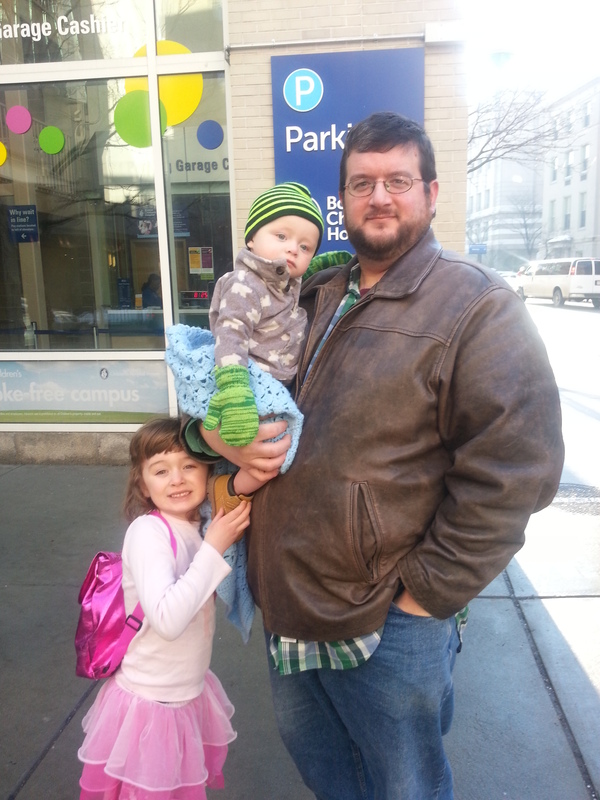 Timshel is empowering because sometimes as a parent it seems like you have no choice. You just do the right thing even when that’s much harder, but you DO have a choice. Good parents are good parents because of that choice. Even though I mess up ALL THE TIME as a mom, I can live with myself because I keep that in mind. As expected, it has been quite the whirlwind of a start to this school year. Balancing things has been a challenge, but is going more smoothly than I thought it would -which is kind of relative since I was expecting complete and utter disaster haha. The fact that we have not left one of the kids somewhere or ended up driving to work still wearing pajamas are things I am checking off in the success column! Dan & I are adjusting to life working opposite shifts, which is great for our kids, especially for Finn to get to programs & appointments only offered during working hours, but a little rough for mom & dad since that means we are either at work or on our own with both kids and doesn’t leave too much “us” time, but just like being a working parent makes you appreciate the hours you get with your kids; I think the time Dan & I get together now is more precious in a way too. It was interesting that besides learning how to sign the entire book, they really focused on how to share the book. For any teachers out there, it was basically SIOP (Sheltered Instruction for ESL students) and when you think about it, deaf kids are ESL students because knowing ASL is not the same as knowing English. But just like I learned during SIOP training, sharing a book instead of just reading the words is good for ANY child’s reading & language development. Here is an interesting site explaining the 15 Principles for Reading to Deaf Children (most of them are great principles for reading to ANY kid)!. There’s that theme popping up again- the thought that has been with me through any class/lecture/trade book/Professional development/Child Psych course I have ever taken. Whether the focus be on Special Education/Special needs kids, ELLs (English Language Learners), Behavior adjustment kids, or my own deaf son, the parenting/teaching techniques I learn for these kids are great for ANY kid. Keeping that in mind not only helps my “mainstream” students & my hearing daughter benefit from these “special” strategies, but also help lessen the focus that the other kids are “different”. Best teaching and parenting practices are the best for all kids and when I get into a moment where I doubt myself as a teacher and/or a mom and start asking myself “am I doing a good enough job helping Finn develop (or for this student who has trouble focusing/reading/understanding English)?” I try to keep in mind that if I’m trying my best to use those best practices than I shouldn’t have to worry too much. I hope that none of this sounds preachy. Ugh, I would be extremely disappointed to have made anyone feel that way! I am way more insecure than I come off on here sometimes. When I write these posts, I edit them over and over again. I gather my thoughts & then word them in a WAY more put together way than I ever thought them the first time around. I have had a lot more moments where I’m questioning myself, down, stressed, etc. than those moments of clarity when I pull myself up by the bootstraps and think about timshel, but what good does it do to write about the bad moments? I’m trying to use this as way to help keep family/friends informed of our journey and, if possible, help anyone else who is going through the same or similar thing understand how it was from my perspective. I hope that is how people take it. This might be my last post for a while for a couple reasons. First, we really dove right in with all Finn’s treatment and therapy this summer so there is not a ton of major things/visits/news (relatively speaking) until we get closer to the CI surgery…reminds me of planning a wedding- you do a TON of stuff a year to 6 months before it and then there is a lull until right before when you are bombarded with last minute prep. The second reason is because school start Monday and I go back to work. It is a much different feeling this year than any other. Usually, I am chomping at the bit to get back by this point, excited to meet new students and see how much my 7th graders have matured (or not!) over summer as they grew into 8th graders. The year Kayla was born was tough because I was afraid I would miss too much and guilty that I wouldn’t be with her when she was so small. This year is just wrought with anxiety. If everything was fine with Finn I think it would be a much easier transition to go back to work than it was after baby #1, just because everything is a little easier second time around, but the anxiety is more centered on how I am going to maintain the level of dedication and commitment to Finn’s treatment and maintain the high expectations I expect from myself as a teacher. The reality is that I’m not going to and I need to be honest and forgiving with myself (way easier said than done). I won’t be able to attend the Parent-Infant classes at the school for the deaf, I am going to miss some of the more routine appointments for things like hearing aid molds and check ups. On the teaching end, I am not going to be able to stay at school until 5 or 6pm three or four times a week. I am not going to be able to commit to doing much, if any, after-school professional development or meetings. I’m not going to be able to e-mail parents about every little thing that happens to one of the 120 students I have. The kids might not get an answer to their emails they frantically send me at 10pm about their homework. I HAVE to be OK with that though I don’t know how I will refrain from beating myself up about it…baby steps though. I know the people around me understand and that does make it ten times easier. Dan will be home with Finn for now and be able to take him to appointments; early intervention scheduled us as late as possible so I can make the second have of the weekly sessions; and I work with pretty much the best colleagues ever and have a very understanding principal who I know will understand that when I run out the door as the bell rings, it is not what I want to be doing, but it is necessary. In the meantime, there is still a week to cram visits and appointments into and it is a busy one! We had another ABR for Finn this morning, possibly his last (though there is a slight chance they’ll do another at 6 months, but hopefully not). The results were the same, and when the doctor entered the room and told us that the results are showing that he is Bilaterally Profoundly Deaf (like they have shown at the last FIVE other hearing tests) there was a TINY part of me that wanted to do a very sarcastic “Holy MOTHER OF GOD! THAT IS BRAND NEW INFORMATION” quote from the always quotable show Friends– (http://www.youtube.com/watch?v=tlBh82TFn0Q). It is weird though to step outside of myself and think about the difference between the first time we were told this and now and the fact that we can joke about that news makes me feel pretty confident in how far we’ve come. Also this week, like every week, we have Early Intervention coming. I haven’t written much about those visits here (there is more information about EI for ALL kids below if you are interested), but they have been fantastic. Our therapist is a Teacher of the Deaf and Speech Language Specialist. So far, since Finn is so young, she has mainly been a resource person. Someone to check in with, to make sure we have all the contacts/information that we need and offer her expertise in any way she can. 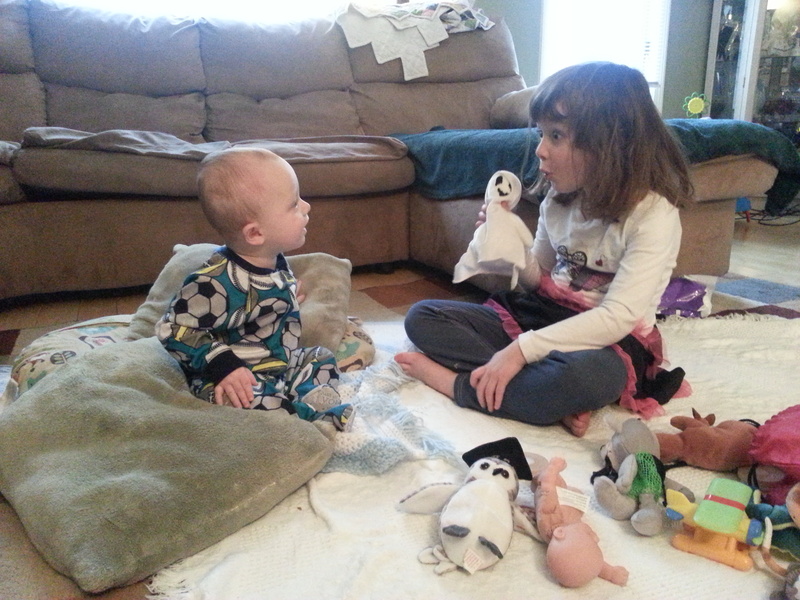 As Finn gets older she will work on him with signing (she is a hearing person, but fluent in ASL and went to Gallaudet!) and other developmental games/strategies. As opposed to his specialist doctors who focus on his hearing/ears, she looks at his overall development as a baby. If there was an area that had nothing to do with hearing, say for example, gross motor skills, she would also work with him on that. Luckily every assessment she has given him has him at or above his age level for every developmental aspect (besides hearing, of course). Interestingly, even his verbal/output skills are at age level as of right now and she said it is actually common for deaf babies to be at age level with that until 6 months old when most babies start forming more concrete sounds- this is one reason why before the Newborn Hearing Screening started, most babies weren’t identified as deaf until at least 6 months old or later. The awesome part about this is that if his development stays on course like this and he gets his CIs at 10 months and activated by 11 months, he really only misses out on 5 months of speech development. This is another reason why they are pushing for earlier CIs. There is a VERY good chance that speech-wise, by the time he is in school, people won’t be able to tell he is deaf from the way he speaks, which I am sure you can imagine is huge both developmentally AND psychologically. The other reason hitting all the milestones on time is huge for Finn & us is that it continues to rule out any syndromes that could have caused his deafness. At this point, they are thinking it is probably genetic, but we don’t know which gene and if that is linked with anything else at this point, but every time he reaches a milestone or another test comes back, we get to rule out certain additional concerns. Hmm this is a bit personal, but I think it is important to share… With Kayla, each developmental milestone was celebrated in a way that only 1st time parents do. Her first smile, laugh, roll-over, holding her head up, etc. all these things are made to be such a big deal- phone calls made/texts sent/Facebook statuses shared for each little accomplishment. With Finn, to be honest, I thought this would be dampened a bit. I mean, besides the whole second-child, been-there done-that thing, right after his diagnosis I figured, why would I bother worrying about the exact moment when he did these “minor” things when it would be overshadowed by what he wasn’t doing? I thought a lot about how the time would come and go when he was supposed to babble and he didn’t. I thought about how he might not like games like peek-a-boo because he didn’t hear us behind our hands giving him a prompt that our face was about to pop out, and he would be startled or scared instead. I thought I was just going to have to accept that he would be delayed and that was all there was to it. But something our SLP said to us early on helped change that attitude. She said that yes, MANY deaf children are delayed in certain areas, but he doesn’t HAVE to be. With the right services and therapy, deafness does not necessarily mean there will be a developmental delay. Are there differences? Yes, of course. We sat three rows back at the Irish concert at Folk Festival and he was happy as a clam no matter how loud they played! He watched fireworks at 2 months old and was completely entranced by the lights without the negative of being scared by the sound. When he turns 6 months will his VERBAL output be the same as a hearing 6 month old? No, but will he babble & start to “say” versions of words that will turn into real words? YES, he will just sign them! Babies exposed to sign early on can start a form of signing that is very much babbling, just with their hands instead of their mouths! I have heard this analogy before, but I heard it the other day form our new pediatrician (who is AWESOME by the way!) and have to share it: When we had Finn it was like we got on a plane, thinking we were headed to Spain for a fantastic vacation, but the plane landed in Holland instead. It is still going to be a great vacation, just not the one we were expecting to take. I LOVE LOVE LOVE that and was so happy she reminded me of that so I can apply it to our life. Because, it is not what we were expecting. We were not expecting to be shuffling back and forth to appointments, to be learning a new language, to be preparing for our baby to have a major, life-altering surgery, but you know what? The people we have in our lives because of this unexpected trip, have enriched our lives in more ways than I could have imagined. The people who have reached out from all aspects of our lives, old friends, new friends, even a couple people we might’ve written off as not part of our life anymore, doctors, specialists, nurses who know exactly what to say, ASL tutors, a CI user who said “it’s a great time to be deaf!”, Deaf people with a capital D!, a new pediatrician who might just be where I wish we’d been the last 4 years, people in the Twitter-verse & Facebook-land who share resources or encouragement, kids & adults some of whom face far worse diagnosis’s who inspire us, all of these connections that would not have been part of my life if Finn was hearing. I won’t sit here and pretend and say that if I could go back and change history and make Finn hearing I wouldn’t, because I probably would just to spare him any difficulties because every parent wants to spare their kids from difficulties if they can, but I also won’t say that it has been a bad thing. The future is still SO up in the air. How will the surgery go? How will his results be with CIs because everyone is different? Will he go to a mainstream school? If so, what school system will he end up in? Will he identify as part of the deaf world or hearing world? The list goes on and on, but one thing I know for sure is that NO MATTER where the future takes us, we are not alone and I am a better person because of the people who have come into my life in the last 4 months. Speaking of connections, we have made a lot of connections both in-person and online with people over the last few months. I figured it might be nice if I left you all with a list of resources we are using in our life, that way, if others are needing assistance or a connection, they might be able to find it here. Also, my hope is that if there is anything not listed here that might benefit our family, I’d love the feedback. For people in the Twitter-verse, we are Massachusetts-based so that is where our services are centered, though I am sure there are similar services in every state. 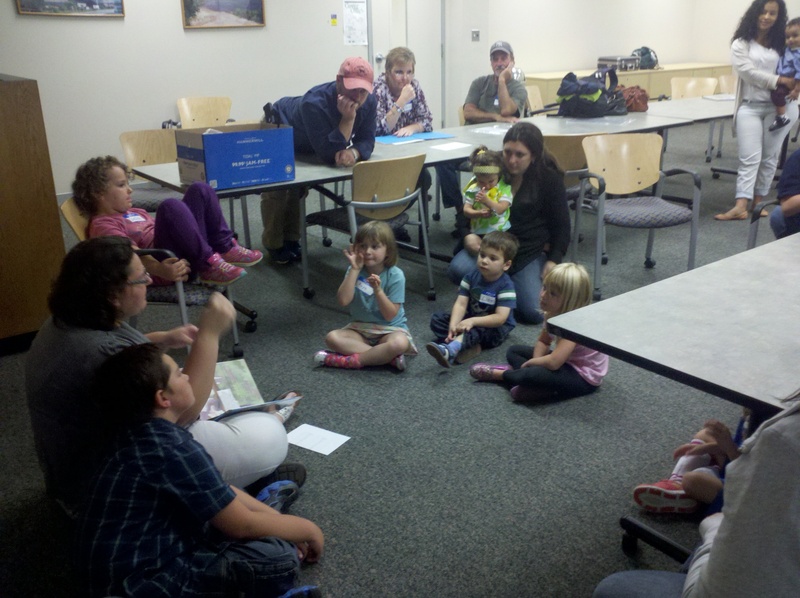 – Family Sign Language Program: This is a FREE service for all families of d/hoh children. Ours is starting October 3rd. Just to give you a heads up, we contacted them at the end of MAY and this is the first time a tutor is available, so DO NOT WAIT until the recommended 6 months old to contact them! The cool part about this program is that an ASL tutor comes to your house once a week and will teach ASL to ANYONE who is in your child’s life. This includes all relatives, siblings, child care workers, teachers, friends, literally anyone who has contact with your child and wants to come is invited. Pretty cool! – Anne Sullivan Center/Early Intervention– Parents of Infants HEADS UP! Early intervention can be awesome!! If anyone is reading this and they are having a hard time in ANY development area with their child age birth to 3 years old, contact them! It is NOT an admission of any failure as a parent; it is a fantastic, FREE resources (for kids who qualify) for any parent to get professional advice on any development worry you might be having. Since starting with them (it’s pretty much a given that any deaf child will be automatically enrolled in EI) I have realized how many people could be utilizing these services who probably don’t even know about it. If you want any info, please let me know. I COMPLETELY understand what it is like to want to feel like super-parent and to think, hey I am intelligent, I have read every parenting book, magazine & online source out there, I don’t need some outsider’s help. Let me tell you, this is not the case at all (from my experience). Their role is to facilitate helping your child develop in a way that works best for YOUR parenting style. I talked above about our experience with our Teacher of the Deaf/SLP, but they have specialists for every area including OT and PT. – Boston Children’s Hospital Deaf & Hard of Hearing Program: I feel like I have bragged a lot about how awesome Children’s is. This program is just another way they go above and beyond offering many professionals who specifically deal with d/hoh children and, just as important, fun, free, events for those families, like the Discovery Museum trip last weekend and a Drumlin Farms field trip a few weeks before that. So far, the kids in this group seem to mostly consist of device-wearing children (hearing aids or CIs) and communicate a lot through verbal communication, but there is some signing going on too. Best part is that most of these events are nights/weekends so again, the whole family can attend! –The Learning Center School for the Deaf Parent-Infant Program: This is an ASL zone! Interpreters are available, but mostly ASL is used on campus, which can seem overwhelming at first, but really forces you to pick up on things. The PIP is mixed with both hearing and deaf parents and when you go there is a half-hour playgroup time for the whole family and then they take the toddlers and older kids for an hour to do fun activities (including hearing siblings!) and offer a parent support group to us with experts in all types of concerns/areas that you will face as a parent of a deaf child. 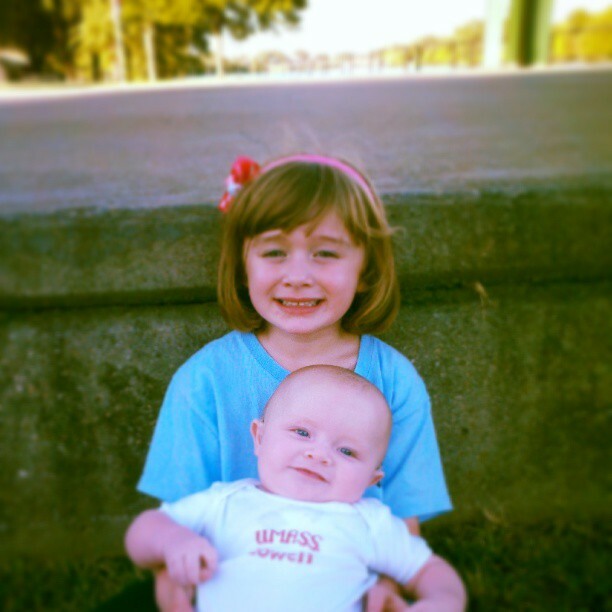 Everything from IEPs to social issues to just venting about normal parenting issues! They also have “Silent Dinner’ events and other get-togethers. They treat you like you are joining a family and have been more than welcoming to us. Downside is they are in Framingham which is a hike & half for us and a lot of services are during the school day since they are actually a school and so that counts me out of most of their services. Dan will continue going while he can though and we hope to maintain a relationship with them especially on vacations/summers. As opposed to the Children’s D/HoH group, a lot more kids here rely on sign and not nearly as many hearing devices are used. That is not to say that they are frowned upon! Contrary to stories we have heard, we have NEVER encountered even the slightest conflict or judgement from a deaf person when we say we are having CI Surgery. Ha, actually we have only ever been given attitude about it by one person and she was hearing! Dan & I are also looking into taking more advanced ASL night classes here if we can manage to drive to Framingham at night weekly & get a babysitter for the kids…we’ll see! –Boston Children’s Hospital Cochlear Implant Program– yet another aspect of Children’s we are utilizing and probably the most important. 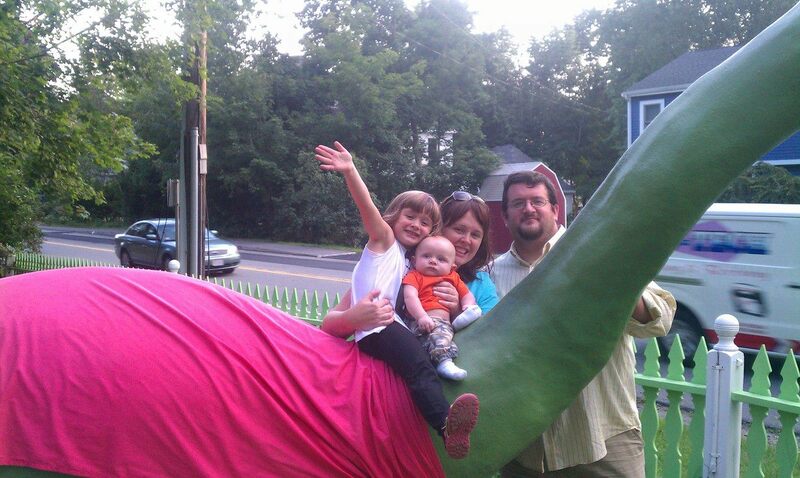 If you are in New England and are thinking about CIs for your child at least meet with them. We are very lucky to have Mass Eye & Ear and Children’s and now Tufts Floating Hospital all doing CIs with great success rate all within one relatively small city! Wherever you choose to go, you will be in good hands, but, for us, it had to be Children’s. We have been a part of all 3 hospitals in the last 4 months and there was no contest when it came to where we felt the most comfortable. It is part gut feeling and part research, but there is not a doubt in our minds we made the right choice for us. They (obviously) only work on children so that is their specialty. Also, say you go to another hospital for CI. You see the same specialists, but when you are referred to the psychologist (which all CI patients & their families are) you go to the Psych department. When you go to the ENT, you go to the Otolaryngology department. When you go to the audiologist, you go to audiology. Make sense, right? Not at Children’s. When you see any of the above, you go to the Cochlear Implant branch of the D/HoH program. They have their own wing!! The psychologist can walk down and ask the audiologist a questions and then three doors down get additional info from the ENT. It is incredible! Again, I cannot say enough about how much I love this place and I am looking forward to working very close with them over the next 6 months and then, seeing them every 3 to 6 months until Finn is in his 20s! t is quite the commitment and I am very happy with our choice. 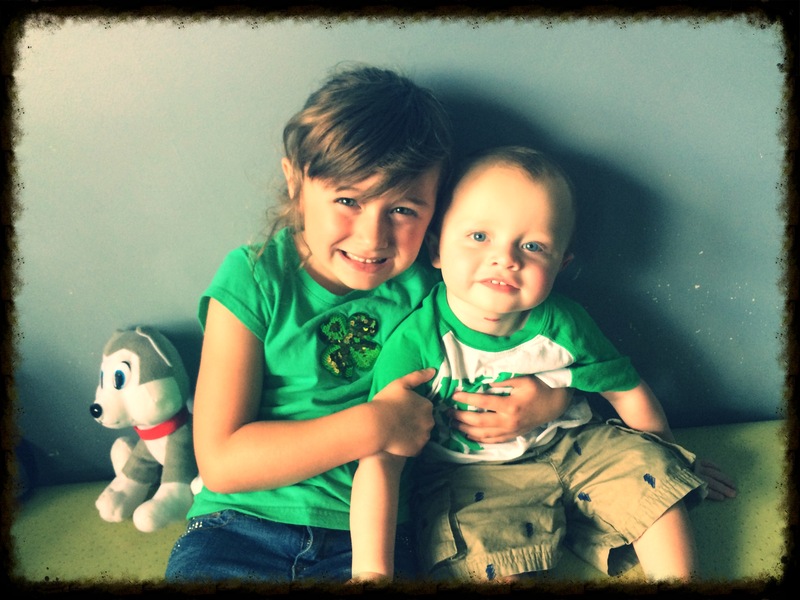 –Foundation Pediatrics– there is a reason I wanted to mention our new pediatrician. As you may have read in past posts we had to switch pediatricians because our last one was not affiliated with Children’s. This was a hard decision because you tend to get attached to the person who cares for the health of your child and we certainly were. Now that have visited our new pediatrician and her nurse practitioner with both children, I am SO HAPPY we made the switch. Not only because I am happy I didn’t back down from getting the services from the hospital I thought was best, but I’m very impressed with how this whole office has handled our situation. The DAY I called to ask to join their practice, I was in touch with a nurse who listened to my story and had referrals for ANYTHING I needed for the rest of the summer, no hesitation. The receptionists, nurses, and everyone I have encountered so far has been friendly & helpful (which was a drawback from the last place where I could tell you a HORRIBLE story about their AWFUL receptionist, but I don’t want to bad mouth on the internet : ). When you have a child who is going to be going to a million different visits, you need a doctor and office that is flexible, timely, and understanding and I think we have found that here. I am happy we made the decision to switch Kayla here as well and don’t even mind the hike up to downtown Nashua for appointments! Besides these resources, I am serious when I say Twitter and Facebook (and to a certain extent Tumblr) have been fantastic assets for making connections. People joke all the time about how they have a certain number of Facebook “friends” or Twitter followers who they never even talk to or would never talk to in the “real” world, but I’ve found some of those very people are the ones who have sent a link, put me in touch with a person, or offered insight into something that I would never have known about had it not been for them. Social media gets a bad rap, but use it to your advantage and it can be a powerful tool! Hope that was helpful and that I am not forgetting anything! Please contact me if you have any questions, comments, additional resources, etc.